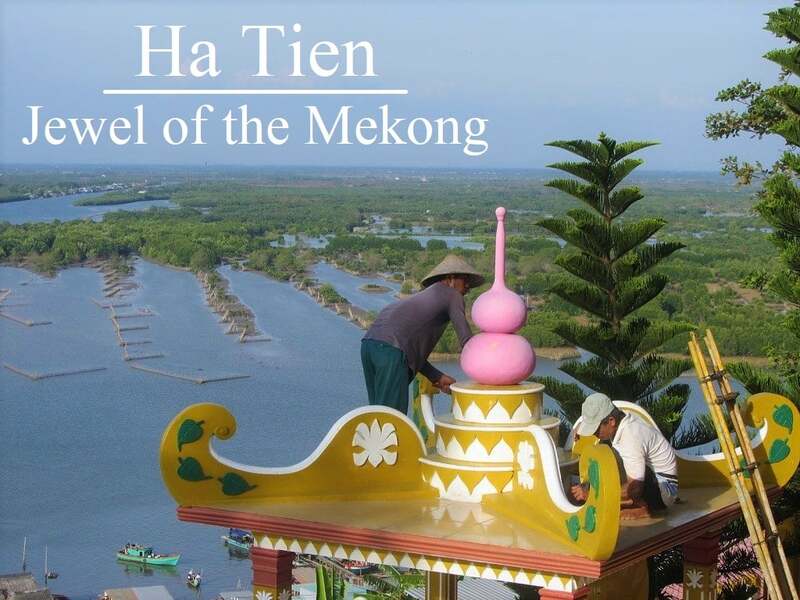 Occupying a perfect position – a feng shui masterpiece of land, water, and wind – in the southwestern corner of the country, Ha Tien is the most attractive place to be in Vietnam’s Mekong Delta region. 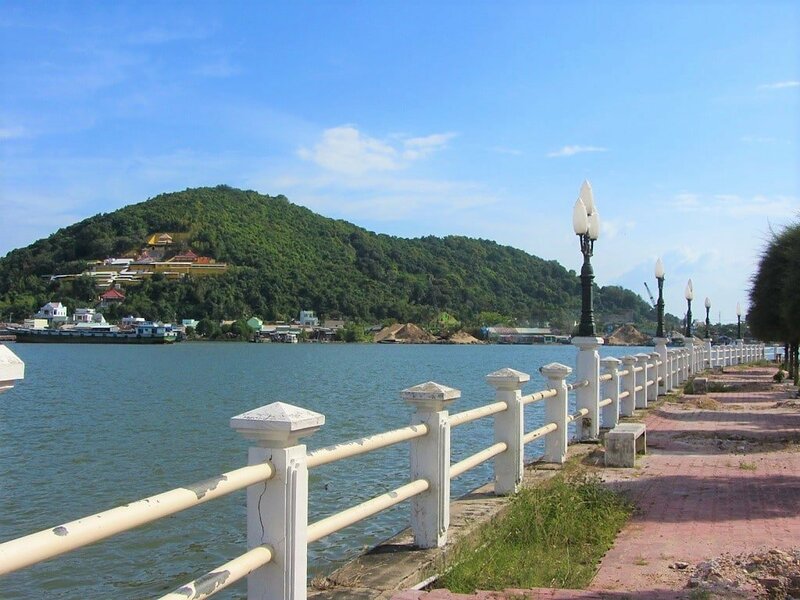 Among its many charms, Ha Tien receives a cooling breeze off the sea, river, and hills throughout the day. Its irresistible combination of bustling markets and languid backstreets, crumbling shophouses and forested hills, delicious street food and local temples, promenading pedestrians and river traffic, twittering swiftlets and chiming pagoda gongs, makes Ha Tien the ‘Jewel of the Delta’. Already a popular transit point for beach bums travelling between Phu Quoc Island and the Cambodian coast, Ha Tien should be a destination in its own right. This is my complete Guide to Ha Tien. As Phu Quoc (only 90 minutes away by boat) has plunged headlong into development, I’ve found myself spending more and more time in Ha Tien, soaking up all that this little rivertown has to offer (and all that Phu Quoc has left behind). Its physical location – nestled between limestone hills on the banks of a river just before flowing into the sea – is only part of its appeal. 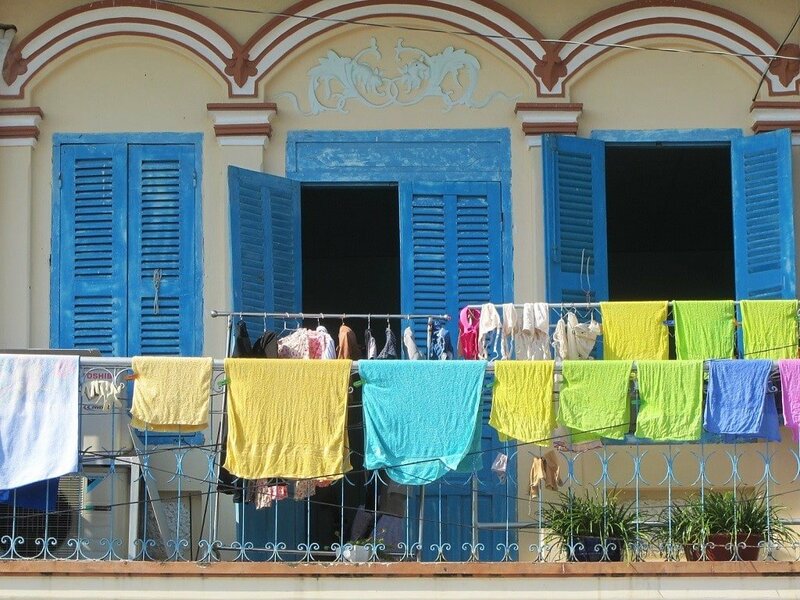 Ha Tien has real charm and character, especially along its quiet, shady backstreets and bustling waterfront. There’s also a lot of history, culture, food, accommodation, markets, excursions, and an interesting ethnic mix, in and around Ha Tien. 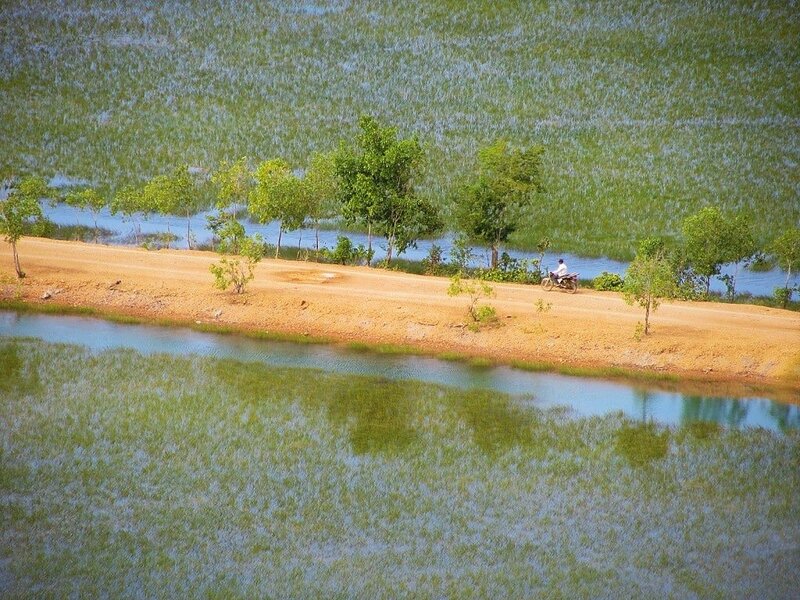 Most travellers only stop by for a day and a night at most, but Ha Tien deserves at least two full days of exploration. This little corner is by far the most attractive part of the entire area south and west of Saigon: Ha Tien is a much more rewarding way to experience Vietnam’s Mekong Delta region than the more popular destinations of Ben Tre and Can Tho, for example. Transport connections to Saigon, Phu Quoc, Cambodia, and other Mekong towns are good, and the weather is best during the dry season (November-May), although a visit at any time of year is worthwhile. Ha Tien lies on the west bank of the Giang Thanh River, whose waters, north of the town, effectively form the border between Vietnam and Cambodia. 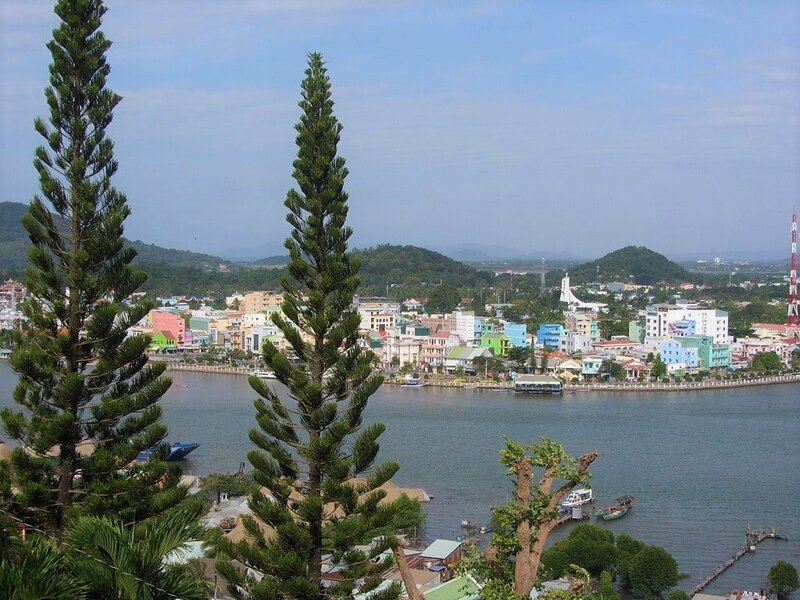 Tucked away in the southwestern-most corner of the country, Ha Tien is bounded by lush, limestone hills to the east and west, on either side on the river. Before entering Ha Tien, the Giang Thanh River forms a body of brackish water surrounded by dense mangrove forest, called Dong Ho Lake. After flowing through town, the river empties into the glassy waters of the Gulf of Thailand. On a clear day, the high ridges of Phu Quoc Island can be seen across the glistening sea and, further to the west, the Cambodian mountains rise in a heat haze above Kampot. It’s a fabulous position for a town, with water on three sides – the lake, the river, and the sea – and hills on two. 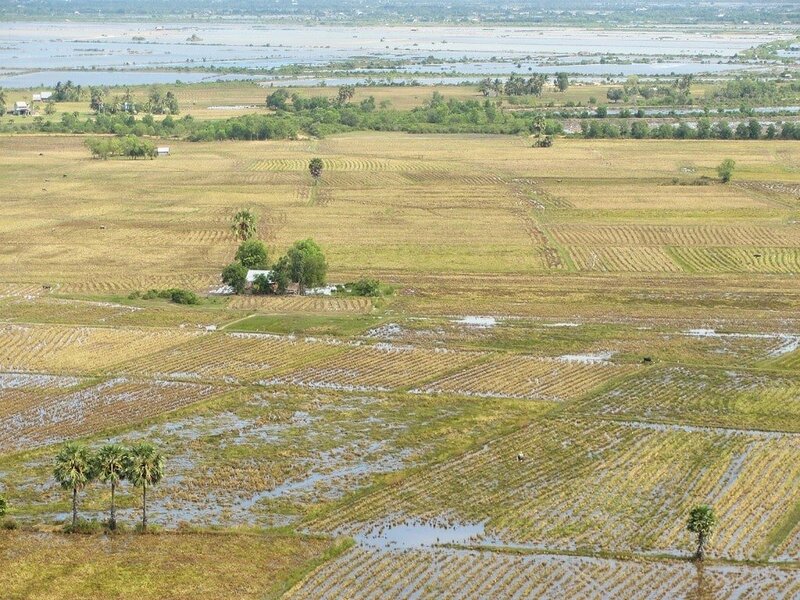 The Xa Xia border gate to Cambodia is just a few kilometres west of Ha Tien, and the nearest major Mekong Delta cities are Rach Gia and Chau Doc (80km/90km southeast/northeast respectively). Saigon is 300km to the east. The vast majority of the Mekong Delta is flat and heavily farmed, so the hills and forests of Ha Tien are a great relief to travellers desperate for some variation in the scenery. But, more than that, the physical position of Ha Tien has an energy, a pull: it feels like the perfect location for an ancient trading post; like there always was, or always should have been, a town here. In fact, there probably was a trading post here from at least the early centuries C.E., when the area was an important stop on the maritime trade route between the Middle East, India, and China. * Indeed, even its name suggests that, over the centuries, people have felt the mysterious force of this location: Ha Tien (Hà Tiên in Vietnamese) means River Spirit, named after the protecting nymphs that are said to dwell in Dong Ho Lake, dancing and bathing in the water under the light of full moons. *Historical information in this article is based on my reading of various sources & conversations with local people. 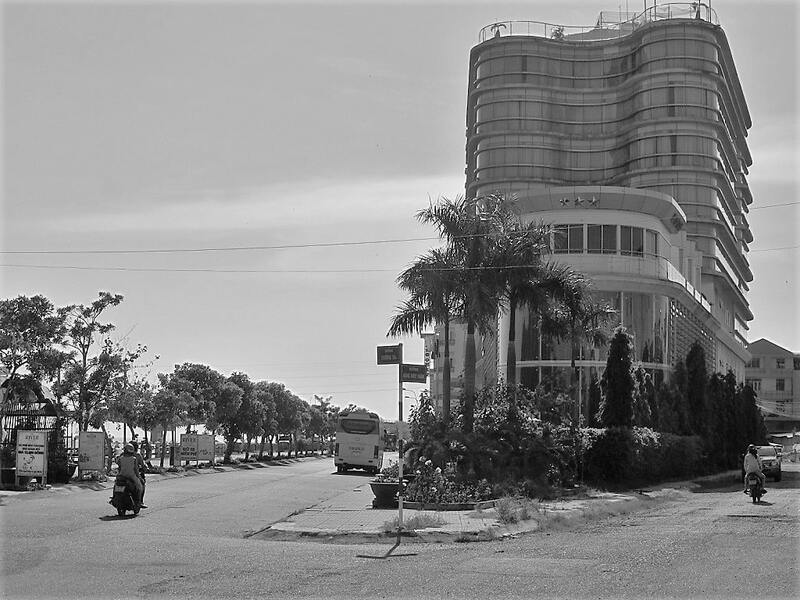 Whatever its ancient roots, the history of modern Ha Tien is usually traced back to Mac Cuu in the late 17th century. A political refugee of sorts, Mac Cuu was a Chinese immigrant fleeing the Middle Kingdom after the collapse of the Ming Dynasty. He founded a Chinese community in Ha Tien at the invitation of the Khmer rulers, only to switch allegiance to the Vietnamese Nguyen Lords in 1708, after which he ruled Ha Tien as a vassal state. As the region prospered (despite attacks from the Thais), Mac Cuu’s descendants (known as the Mac Dynasty) continued to rule Ha Tien for about a hundred years, until the area came under direct Vietnamese control in the late 18th century. 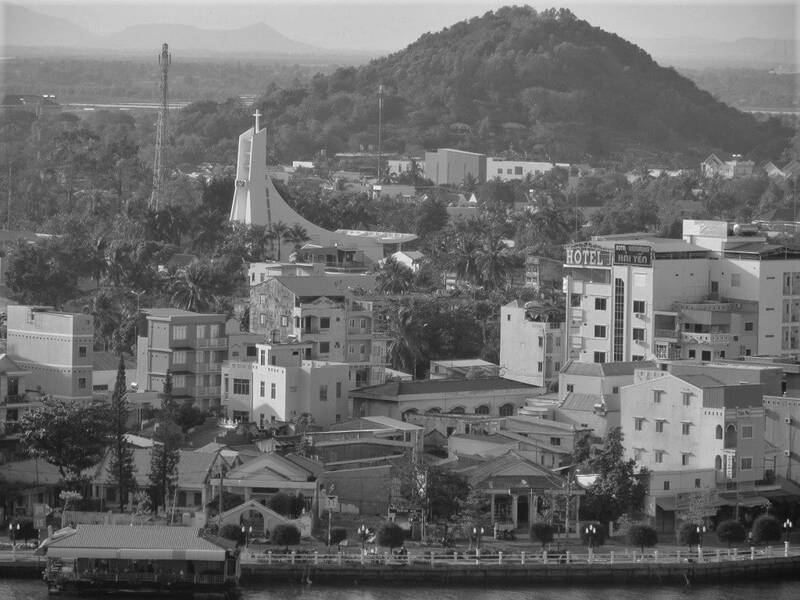 The colonial French took over in the 19th century, then, during the ‘Vietnam War’, Ha Tien became a base for boat operations along the river following the Cambodian border, and, in the 1970s, the area was subject to cross-border raids by the Khmer Rouge. Today, Ha Tien is prospering from cross-border trade with Cambodia and as a transit point between the two countries and the popular beaches of Phu Quoc Island. 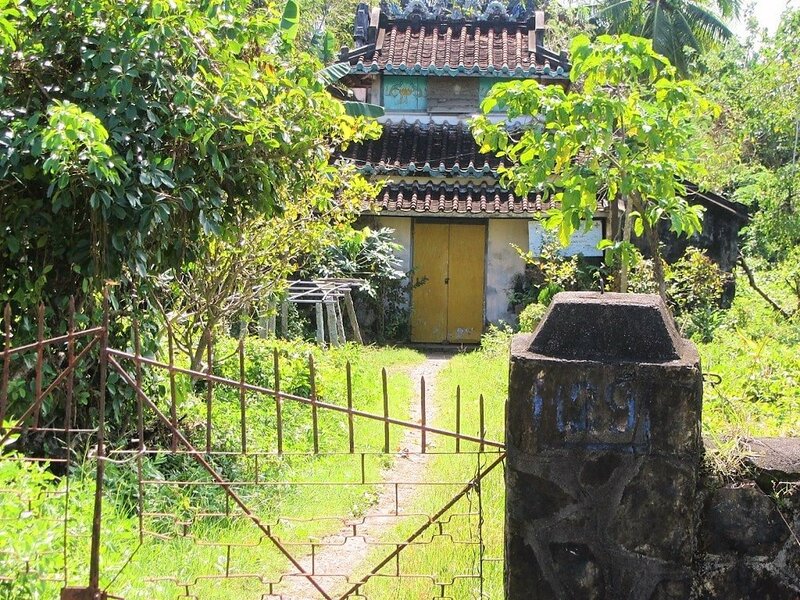 Many interesting remnants and enigmatic traces of Ha Tien’s past can be found in and around the town, and there’s still a healthy population of Chinese and Khmer living here. Despite a recent surge in visitor numbers and investment in major infrastructure projects, including a bridge over the Giang Thanh River and reclaimed land along the coast of the Gulf of Thailand, Ha Tien remains a relatively peaceful (certainly by the standards of other Mekong Delta towns), calm, charming and extremely likable little place. The early mornings are busy along the waterfront, where the markets are located, and the cool evenings encourage promenading and a lot of outdoor dining. 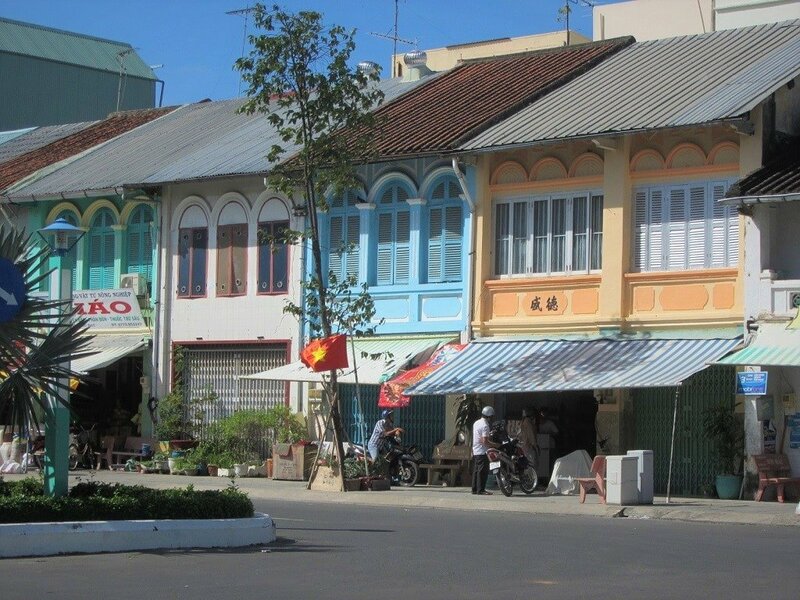 But, during the middle of the day, the streets of Ha Tien are sleepy and quiet, save only for the rustling of leaves and the twittering of thousands swifts nesting in the rooftops, where their saliva-built nests are harvested for their medicinal properties. Indeed, during the hottest hours of the day, Ha Tien puts me in mind of Con Son, the tiny, sleepy, crumbling, seafront village on the Con Dao Islands, way out in the East Sea. It may have an appealingly soporific air, but Ha Tien certainly isn’t boring: there’s a lot to see and do in and around the town, and it’s just the right size to be able to get to grips with during your stay. There’s a good balance of the new and the old, the charming and the raw, the natural and the urban, the left alone and the developed. 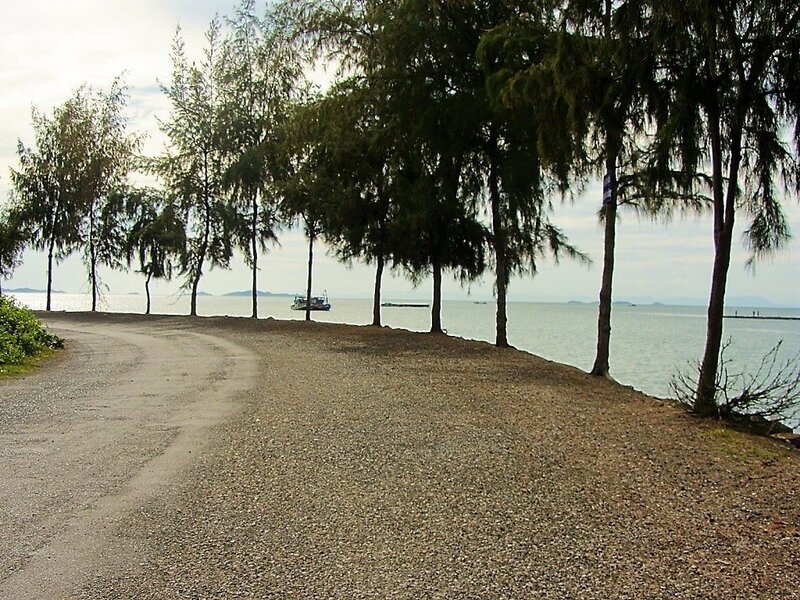 Ha Tien is excellent for walking. 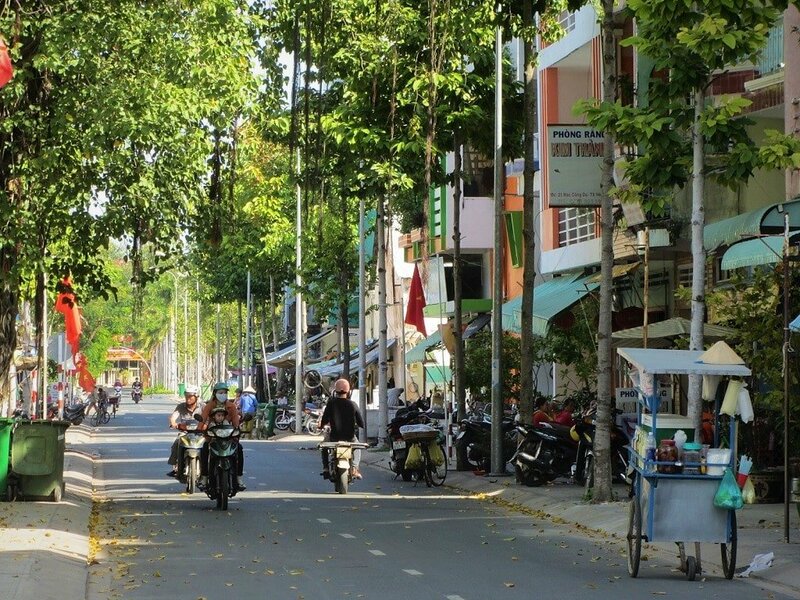 Its small, manageable size, riverside location, and quiet, shady backstreets make Ha Tien easily and comfortably navigable on foot (very rare in Vietnamese towns and cities). Strolling along the length of the waterfront road and then looping back through the grid of smaller streets, is a great way to get your bearings and appreciate the town’s layout. From the lively riverfront, where Ha Tien’s main markets are, to the breezy lakeside promenade (Dong Ho Street), and the sleepy but charming backstreets, exploring Ha Tien on foot is rewarding and fun. 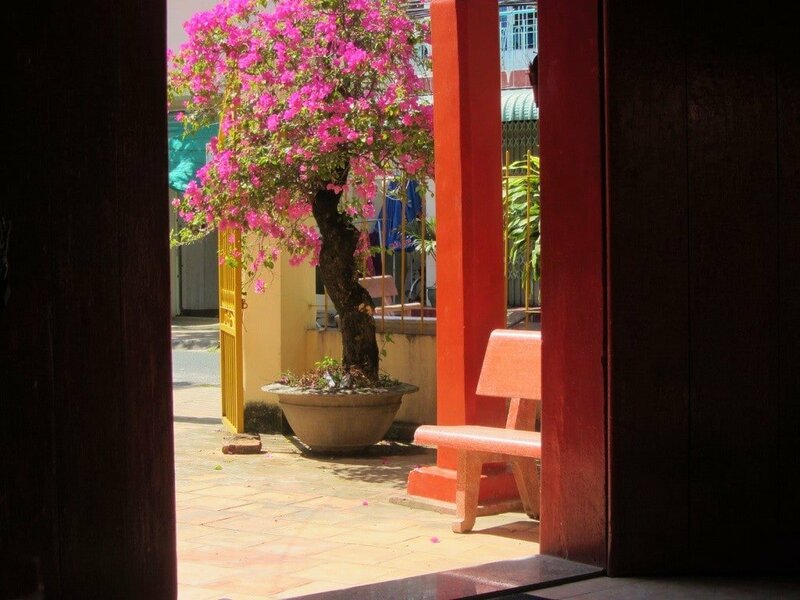 With the exception of the beaches, caves and Ngoc Tien Monastery, all sights in Ha Tien are walkable. 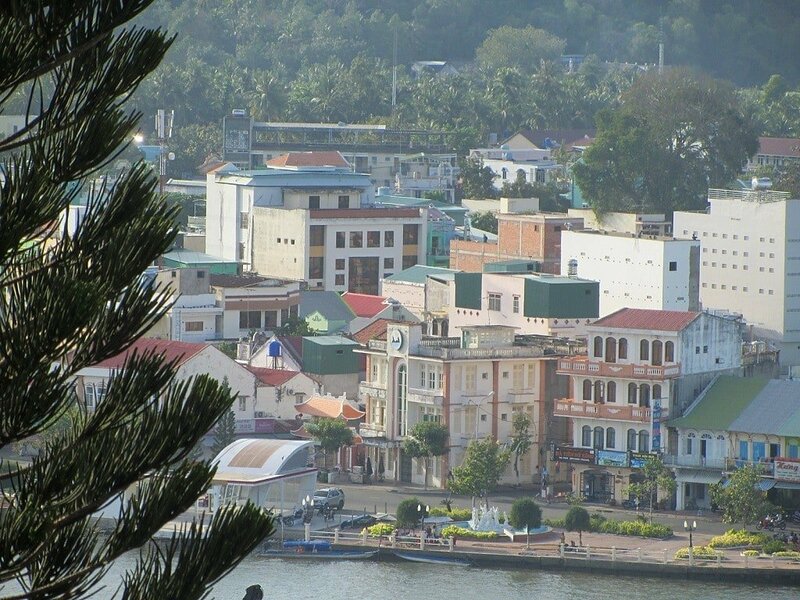 Although it can be very hot and humid during the middle of the day, Ha Tien generally receives a breeze; either off the river, the hills, or the sea. Ha Tien would also be perfect for cycling, and I’d hope to see some of the hotels start renting bicycles to guests in the near future. Apart from Tran Phu and Mac Thien Tich streets, which are relatively busy and unpleasant, walking on any of the streets between the To Chau Bridge to the west and Dong Ho Street to the east is good. Walking from your hotel to any of the temples and pagodas, stopping at some of the places to eat and drink along the way, is an excellent way to spend a half or whole day in Ha Tien. What’s more, walking increases the chances of random encounters and ‘discoveries’: striking up conversation with a local when asking for directions, finding a hidden cafe during the heat of the day, stopping at a streetside food vendor for a snack, spying a crumbling colonial relic, ducking into the shade of a obscure temple – these are all experiences likely to come as a result of exploring Ha Tien on foot. 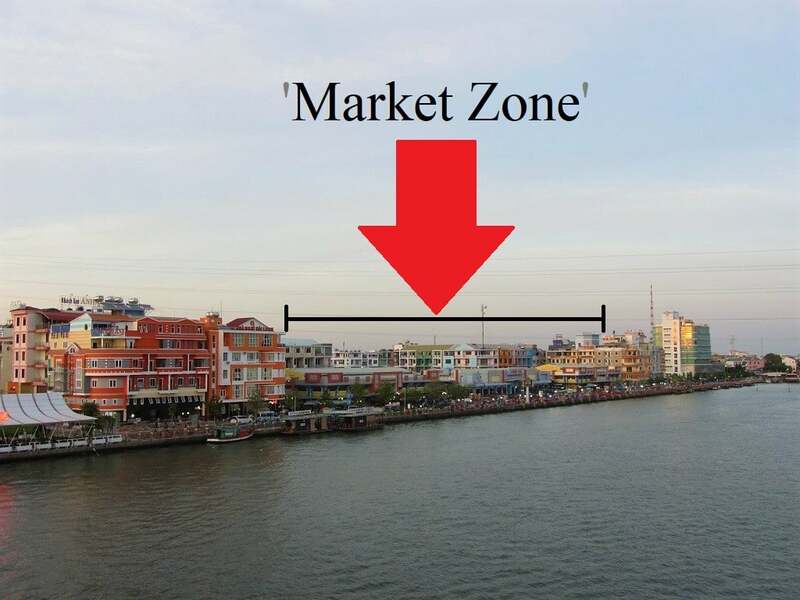 Ha Tien’s ‘market zone‘ is a destination in itself. Recently relocated to near the riverfront, the ‘market zone’ is home to several different markets in four large, hanger-like structures, all of which are teeming with people and produce. 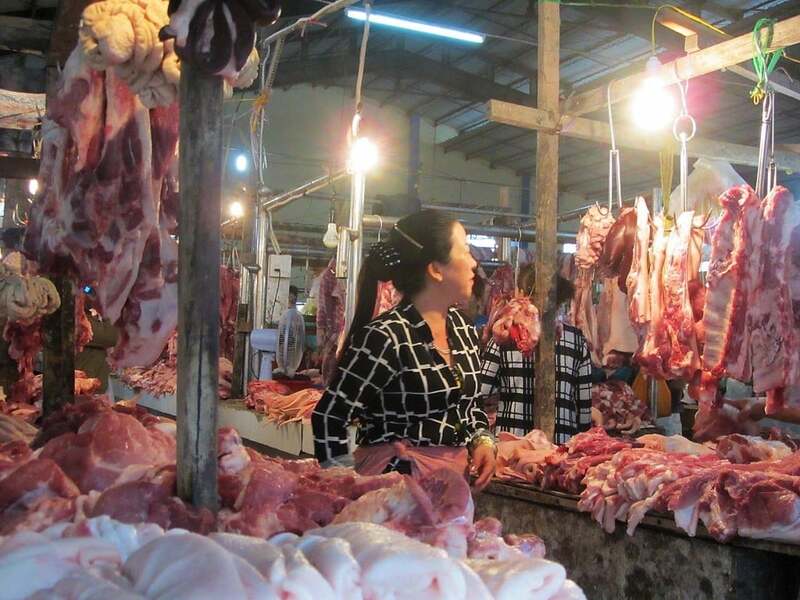 There’s a dry goods market (Chợ Bách Hóa), a night market (Chợ Đêm), and three separate wet markets: one for vegetables and meat (Chợ Rau-Thịt), one for fish (Chợ Cá) and one for cooked food, flowers and fruits (Chợ Ăn Uống-Hoa-Trái Cây). Each of these markets has its own building or zone. The markets are arranged in a T-shape with the riverfront to the south, Tran Phu Street to the north, and the To Chau Bridge to the west. The dry goods and wet markets are at their best in the early mornings, between 5am-9am, when the produce is fresh and the customers numerous. The night market gets going from dusk (around 5.30pm) until 10pm. The fish market (Chợ Cá) is right on the riverfront, where many of Ha Tien’s fishing boats unload their catch in the early mornings. Fish and shellfish of all varieties – from the rivers and the sea – are transferred from the boats to the quay and then organized for sale in the market building: gutted, chopped, washed, and displayed for the customers to bargain over and buy. Get here before dawn to watch the scene unfold. It’s a fascinating spectacle and the produce is remarkably fresh. The vegetable & meat (Chợ Rau-Thịt) and flower & fruit (Chợ Hoa-Trái Cây) markets are on either side of the fish market. Again, the produce looks fresh and clean. Browsing the colourful tropical fruits and trying to identify the myriad kinds of herbs and spices is a reminder of how fertile the Mekong Delta is. 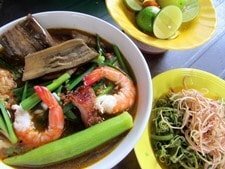 I particularly like the cooked food section, where you can try some of the region’s famous noodle soups, such as bún mắm. Between the fish market and the dry goods market, an open-air piazza of sorts is where the night market (Chợ Đêm) takes place. The majority of stalls, protected from the elements by marquees, sell trinkets, clothes, and various tourist tat. But it’s worth having a look around; for a souvenir perhaps. Along the periphery of the night market are some excellent street food outlets. But, unlike the wet markets, the night market is definitely aimed at tourists – foreign and domestic – which means, sadly, that overcharging is common: make sure you bargain (politely but firmly). Another part of the night market is located by the riverside, in front of the fish market, where seafood stalls set up around dusk. The dry goods market faces onto Tran Phu Street. It’s a graceless building and the most enclosed of all the markets. But inside it’s cool and calm; a labyrinth or clothes and cuddly toys, among other things. Given the mysterious force of Ha Tien’s fabulous location, it’s perhaps not surprising that the surrounding hills, and the town itself, are covered in temples, shrines, and pagodas. From hilltop Buddhist monasteries to the Chinese-style tombs of the Mac Dynasty, Ha Tien has a host of interesting religious buildings to visit, which reflect the town’s history. The Hill of Tombs [MAP]: Dedicated to the dynasty of Chinese immigrants who ruled Ha Tien for most of the 18th century, this lush hillside to the west of town is the site of dozens of tombs of the Mac family. A stone pathway, under a canopy of tropical trees, leads between all the tombs, including that of Mac Cuu, the founder of the dynasty. His tomb, constructed in 1809 at the behest of Vietnamese Emperor Gia Long, is a circular platform cut into the hillside and decorated with figurines and stone dragons. While not particularly impressive, the Hill of Tombs is a very atmospheric and peaceful place to be. Even if you’re not interested in the history of Ha Tien it still makes for a pleasant walk among the trees. At the bottom of the hill, near the entrance, an attractive temple to the Mac Dynasty, built in 1846, is worth a look. Inside, the incense-filled shrine is decorated with various regalia and some delicate Chinese-style wall paintings. If you continue on the pathway through the tombs, it leads up and over the hill and down the other side to the back of Phu Dung Pagoda. During my visit this complex was being revamped, but it includes several tombs and fine sculptures. Entrance to the hill and temple is free: they can be reached on foot from most Ha Tien hotels. Tam Bao Pagoda [MAP]: A block east of the Hill of Tombs, Tam Bao Pagoda is said to have been founded by Mac Cuu in 1730, although its immaculate condition suggests many renovations and additions over the years. The gardens and chambers are attractive and highly decorated with statues of the Buddha, the Goddess of Mercy, and famous monks. 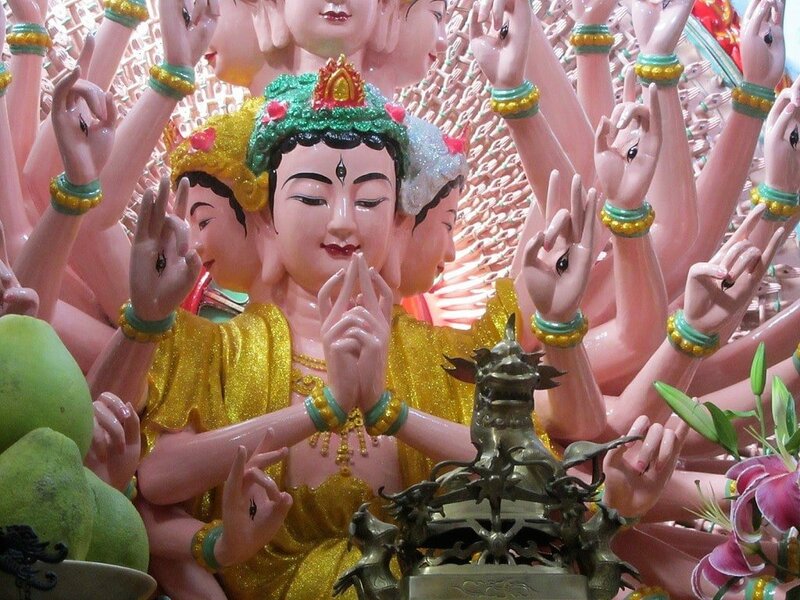 This is Technicolor Buddhism, with garish pinks and yellows and elaborate statuary, so don’t come here expecting a sense of history and times passed. Behind the main temple are the tombs of 16 monks in a peaceful garden. Like many temples in Vietnam, the atmosphere of calm and quiet within the temple complex belies the excessive kitschness of the ornamentation. 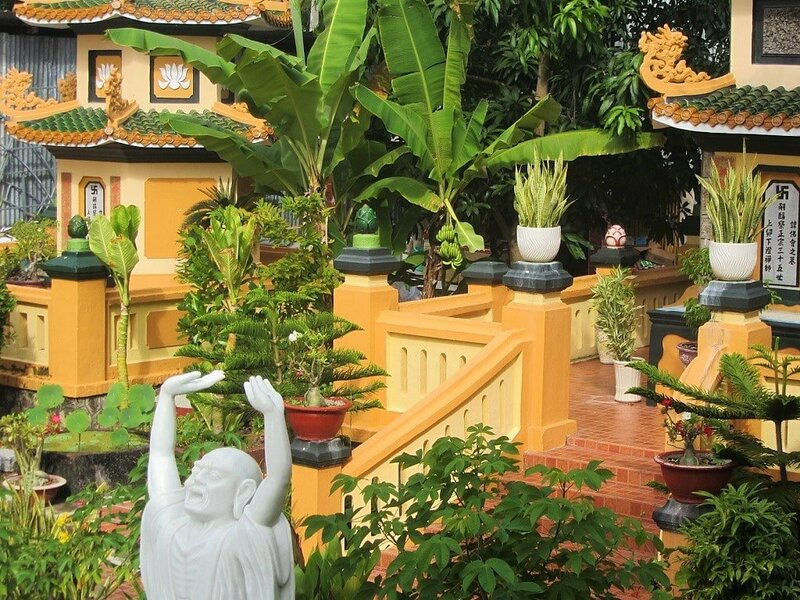 Local Temples: Ha Tien is dotted with small and intriguing local temples. Most are still active places of worship, but some, particularly on the outskirts of town, have been left to decay; taken over by moss and tropical foliage, their walls and roofs caving in, their purpose forgotten, even by local people. As you walk around town, you’ll notice these little temples – on a corner in the shade of a tree, squeezed between two new townhouses, or crumbling in a field of herbs and elephant grass. I couldn’t find much information about the few abandoned temples around town; local people simply said they were very old, dating from before French colonial times, but couldn’t offer any more details. However, the sight of these old temples adds a sense of mystery to Ha Tien, which I very much like. I haven’t marked them on my map, but you’ll notice these temple if you pass by. Of the other small, active temples in town, Chùa Bà Mã Châu and Chùa Ông Bổn are worth popping into. The former is a small, bright place with pretty, decorative roof tiles, and wooden columns and beams; the latter dates from 1880 (according to the lovely old man who looks after it) and is filled with elaborate relief sculptures and wall paintings, including one of the ship that carried Mac Cuu from China to Ha Tien in 17th century. There are many other temples, shrines and pagodas on the streets of Ha Tien. What they may lack in grandeur and size, they make up for in atmosphere and colour – all of them are serene, cool, fragrant spaces filled with painted surfaces and flowers. All the temples are walking distance from most hotels. Entrance is free. Ngoc Tien Monastery [MAP]: On the south bank of the Giang Thanh River, Ngoc Tien Monastery occupies a commanding position on the slopes of To Chau hill, looking down over Ha Tien and the confluence of the river, lake and canal. Painted yellow and red, this sprawling Buddhist monastery is visible from almost every street in Ha Tien, across the river. Accessed via a narrow alleyway and a long, steep staircase winding up the hill and through the monastery chambers, Ngoc Tien is not remarkable for its architecture or decoration, but for its panoramic views of Ha Tien and the surrounding area. Follow the stairs right to the top where a series of terraced concrete steps make a perfect viewing platform. 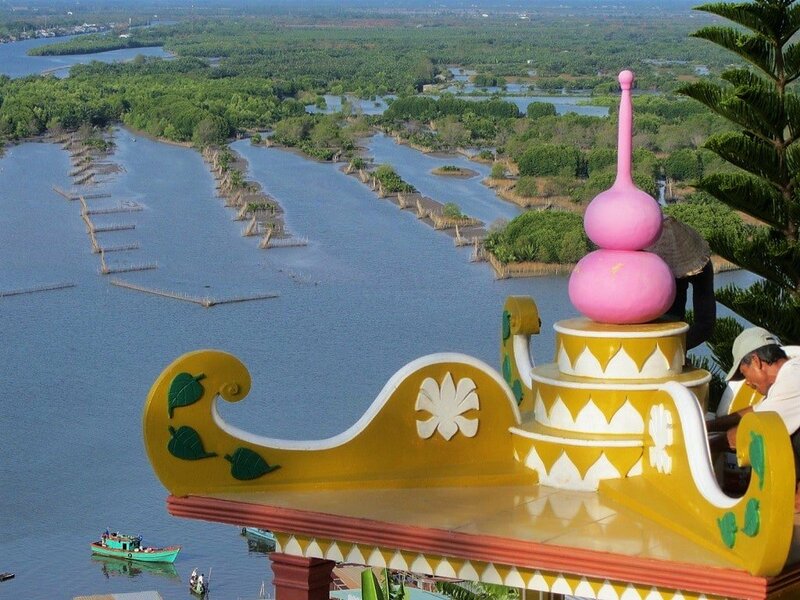 Mornings or late afternoons are the best times to see the views, which stretch over Ha Tien and upriver to Cambodia. 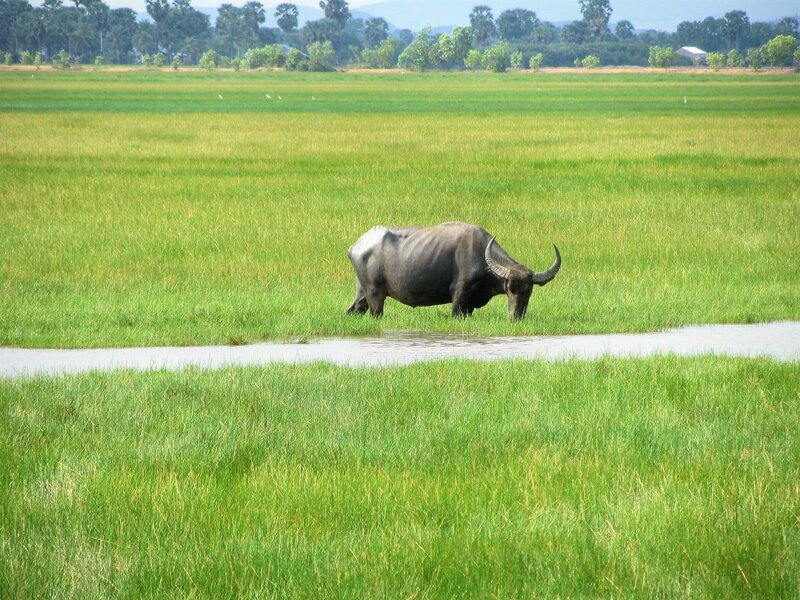 From here you get a real sense of how Ha Tien fits into the landscape: hugging the banks of the Giang Thanh River and Dong Ho Lake, protected and hidden by the limestone hills to the north and south, with easy access to the sea to the west. The pathway up to the monastery is off Nam Ho Street, signposted down an alley: ‘Tịnh Xá Ngọc Tiên. You can walk or take a taxi from most hotels in Ha Tien. Entrance is free. 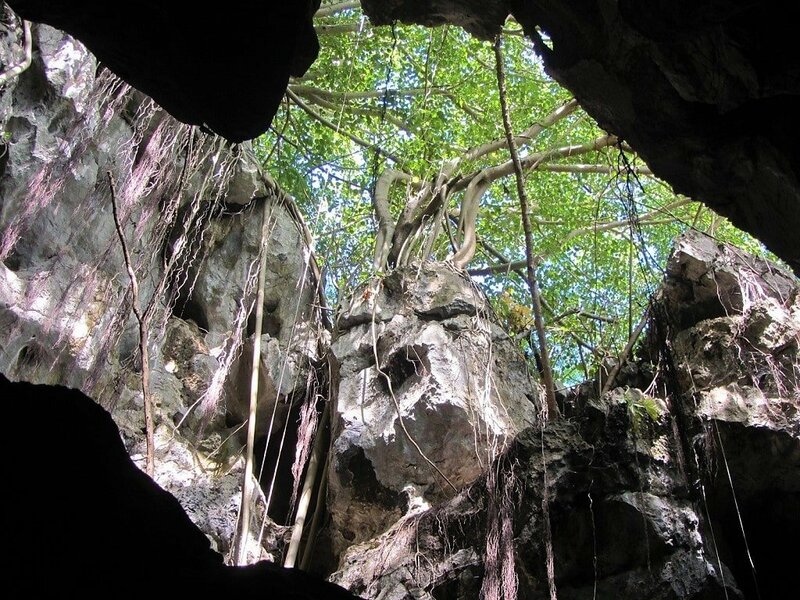 Just north of Ha Tien, the limestone hills straddling the Cambodian border are riddled with caves. Many of these are considered sacred and act as shrines to spirits and deities. 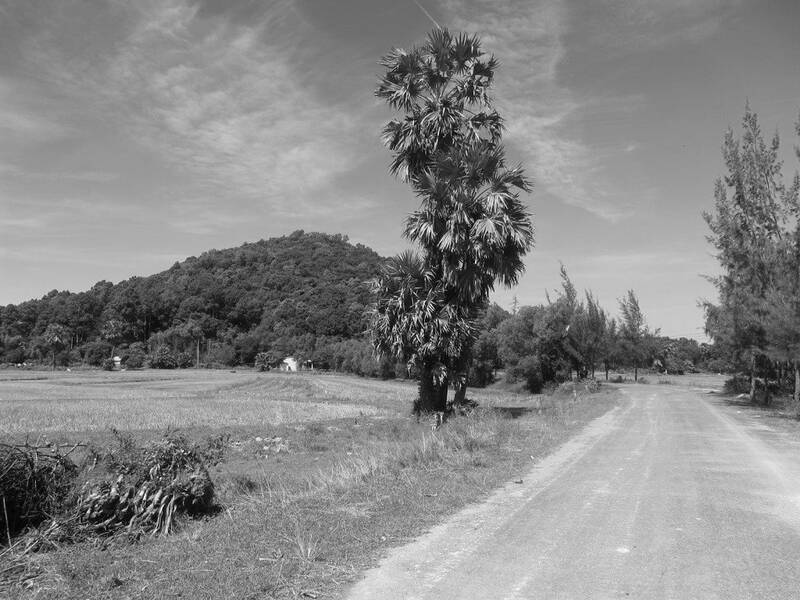 Paved roads lead from Ha Tien and around the base of the limestone pinnacles. It’s a very short but scenic road trip by rented motorbike out to the caves of Thach Dong and Nui Da Dung. Inside, the caves are decorated with statues, and offer welcome respite from the heat of the day. Away from QL80, the main road to the Cambodian border gate, it’s very quiet and the scenery is some of the loveliest in the Mekong Delta region: limestone hills rise from green rice paddies where grey buffalo bathe eye-deep in muddy pools, behind which the stupa-topped hills of Cambodia are just a stone’s throw away. The caves of Thach Dong and Nui Da Dung are set up for visitors to walk around and can be visited as part of a loop, including Mui Nai beach, making a very worthwhile day or half day excursion from Ha Tien. Heading north on Road QL80 out of Ha Tien, Thach Dong is a few kilometres on the right (entrance 10,000vnd; open dawn til dusk). In 1978, the Khmer Rouge, in one of their many cross-border raids, massacred 130 people here; a plaque by the entrance to the caves commemorates this event. The caves are inside a limestone crag. 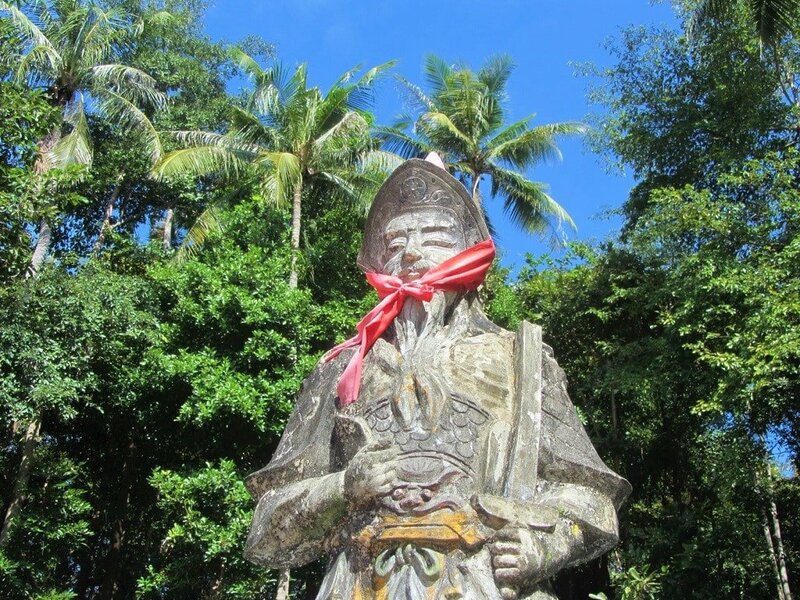 Despite being a popular domestic tourist attraction there’s not that much to hold your interest here, although the caves do have an eerie atmosphere and are adorned with statues of the Taoist Jade Emperor and Goddess of Mercy. But the next cave system is far more rewarding. Bear right (due northeast) at the base of Thach Dong along a beautiful back road (signposted to Da Dung) lined with Lontar palms and leading close to the Cambodia border until it reaches a wall of limestone: this is Nui Da Dung. The imposing, jungle-clad hill is honeycombed with cavities, all of which are linked via a long, winding, and beautiful walkway. It’s an impressive (and surprisingly hot and strenuous) trek through all 14 of the hill’s caverns. Many of the caves house religious statues, altars, and shrines, with burning incense spiraling up through shafts of light, adding a fragrant aroma to the smells of damp and bat guano that permeate the caverns. Entrance is 10,000vnd and there’s a map of the walkway with each cave marked on it at the start of the climb (watch out for the ‘child guides’ at the beginning of the pathway, who will expect money in return for their information). 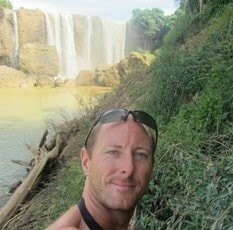 When I visited, I was the only person there: it was great fun clambering up the steps and through the caves, stopping on stone balconies, hewn out of the rock, to take in the fabulous views over the flooded rice fields of Cambodia, north towards the Cardamon Mountains and west to the Gulf of Thailand. At one point on the walk, you are essentially in Cambodia. Indeed, my phone sent a roaming message: ‘Welcome to Cambodia’. However, on the evidence of the carelessly discarded trash on the walkway, I’d guess that, during weekends and public holidays, the caves are popular with domestic tour groups. Try to visit during the middle of the day on a weekday to avoid potential crowds. Remember to bring water and a flashlight, because some of the caves are dimly (but attractively) lit and the walkway is occasionally treacherous and tight. Just west of Ha Tien, a hilly, forested promontory sticks out into the Gulf of Thailand: this is known as Mui Nai. Popular with domestic tourists on weekends and holidays, but wonderfully deserted on most other days, Mui Nai is essentially Ha Tien’s beach. It’s easy to take a taxi from Ha Tien to the beach, but a hired motorbike is a lot more fun (see Transportation for details). Follow Số 6 Street west from the junction at the end of the To Chau Bridge. This takes you through a newly developed plot of reclaimed land at the mouth of the Giang Thanh River. Follow Số 6 to its end and turn left, continuing west until you hit Núi Đèn Street. Turn left and follow this road as it leads along the seafront, all the way around the tip of the promontory, and north to two pretty bays: this is Mui Nai beach. 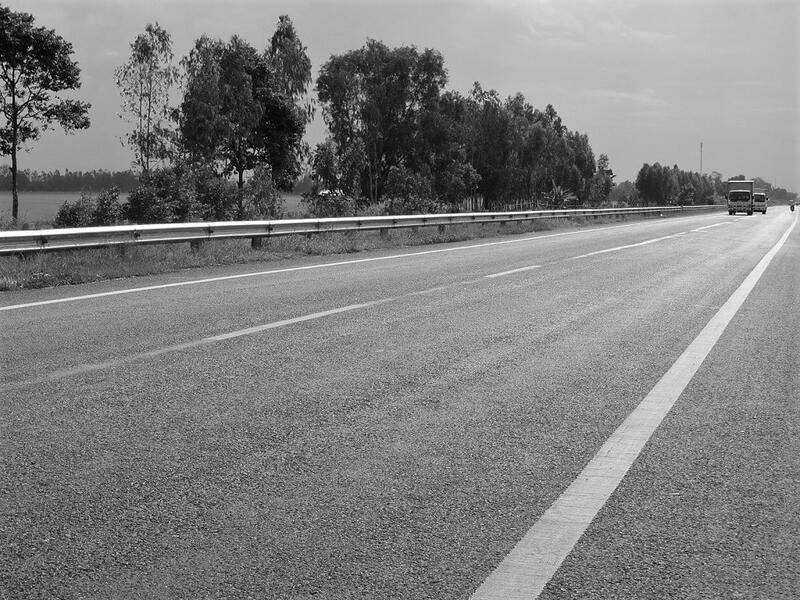 It’s a very scenic ride on good, quiet roads. Of the two, the second beach (the one further to the north) is probably the nicest. On busy days, you might have to pay a small entrance fee at the kiosks, but I’ve never been asked to. 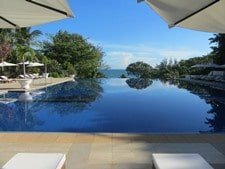 In general (but especially during the dry season: December to May), the water is exceptionally calm, and the views over to Phu Quoc Island and the Cambodian mountains are good. The sand is dark and sometimes a bit muddy, but the water is balmy, shallow, and great for bathing (safe for young children, too). There are lots of waterfront seafood restaurants who also rent deck chairs for sitting on the beach and use of their showers. There’s even a kind of hillside roller coaster, a zip line, and a sea slide. Low-end development dominates the beaches here, but most of it is well-organised. 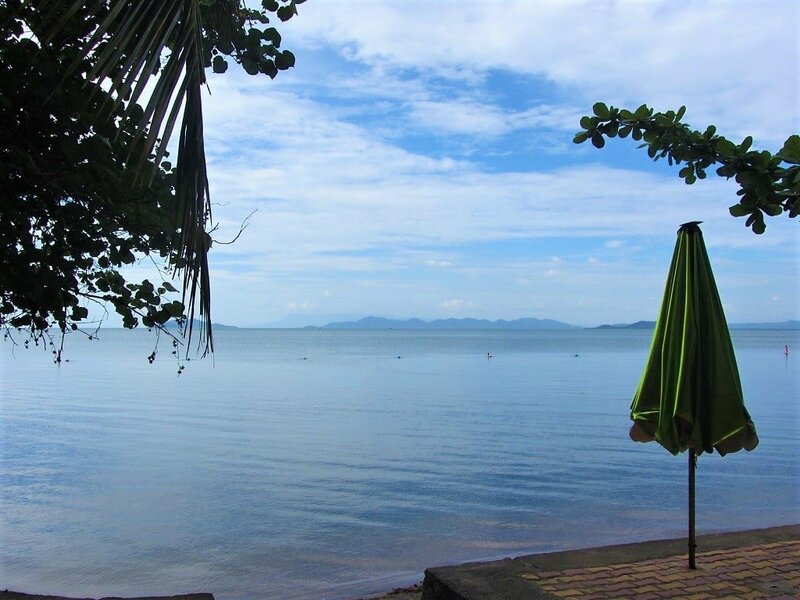 When busy, Mui Nai can become a bit of a messy tourist trap, but when quiet, it’s rather lovely: sitting under the shade of an umbrella tree, eating fresh crab with a cold beer, watching the sun set behind the Cambodian islands. To create a loop back to Ha Tien, head north from Mui Nai beach on Bà Lý road until it meets QL80. From here, either turn right (due south) on QL80 back to town, or follow the back roads along the Cambodian border via the caves of Nui Da Dung and Thach Dong, as outlined in the Caves section. 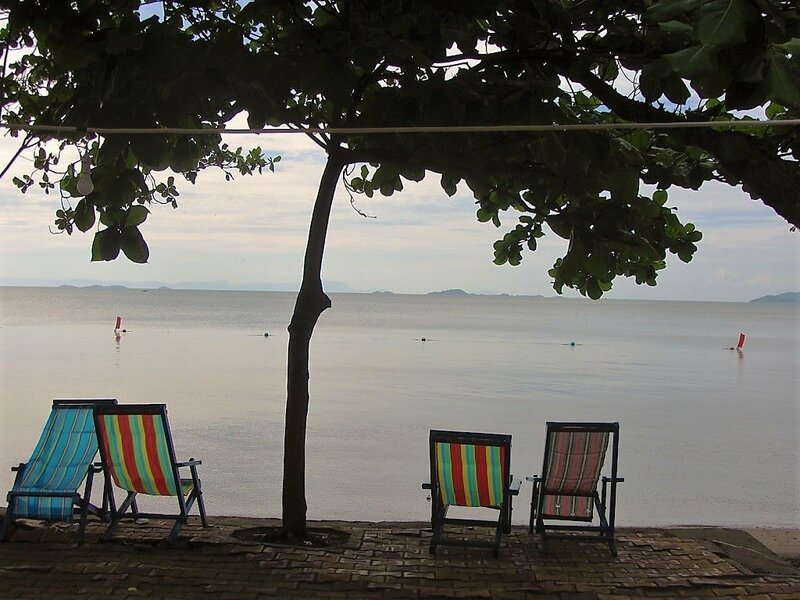 (It’s also possible to stay on Mui Nai beach: see Accommodation for more details). A small archipelago called Đảo Hải Tặc (Pirate Islands) is accessible by ferry from Ha Tien, but at the time of writing the islands were closed to foreign visitors. 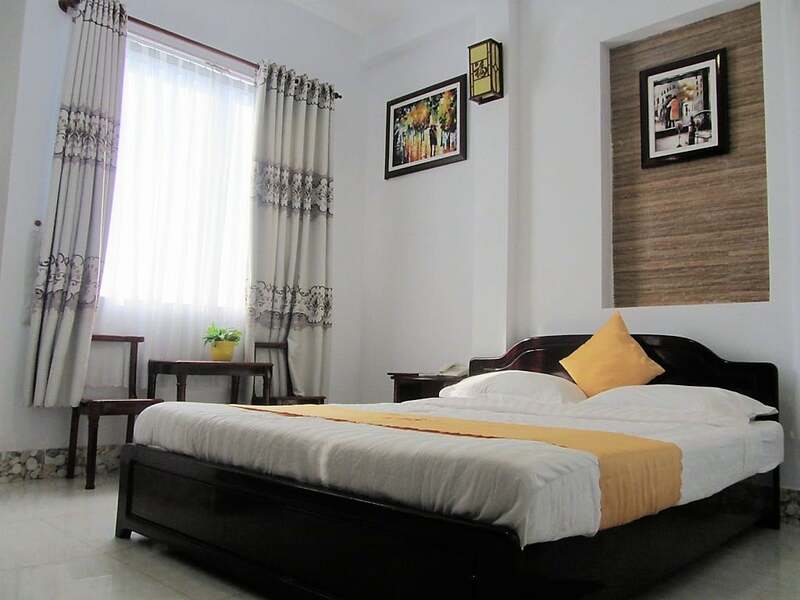 Ha Tien has lots of good-value accommodation for budget travellers. There are also several places to stay at nearby Mui Nai beach. 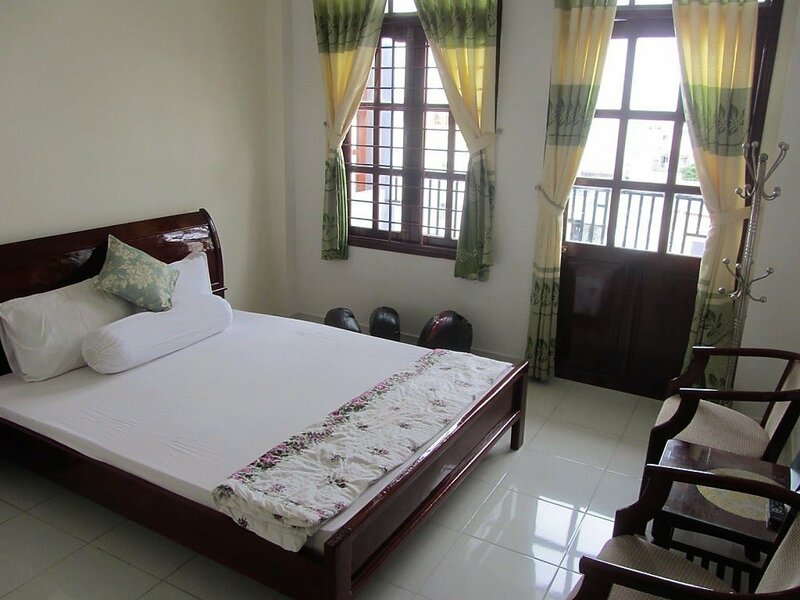 A couple of mid-range hotels offer smarter rooms but, as yet, there are no luxury options in Ha Tien, although I’m sure that’ll change in the near future. *Please support Vietnam Coracle: I never write a review for money: all my content is free & all my reviews are independent. You can support the work I do by booking your hotels via the Agoda links & search boxes on my site, like the ones on this page. If you make a booking, I receive a small commission (at no extra cost to you). Any money I make goes straight back into this site. Thank you. Hai Yen Hotel: 15 To Chau Street; 077 3851 580; [MAP] Straddling the quiet corner of To Chau and Chi Lang streets, Hai Yen Hotel is in the east of Ha Tien, near the confluence of the Dong Ho Lake and the Giang Thanh River. A white-painted five-storey building, the hotel offers dozens of rooms, all of which have either balconies or windows. Particularly nice (and excellent value for money) are the corner rooms on the higher floors, which have views over the lake, river, town and surrounding hills. All rooms are bright, spacious, clean, comfortable, and feature everything you’d expect: hot water showers, air-con, towels, tea and coffee, mini-refrigerator, WiFi, and TV. Staff are efficient and the entire property is kept spotless. Hai Yen Hotel is away from the main cluster of hotels around the markets, which works in its favour: it’s a lot quieter, leafy, laid-back, and less touristy here. 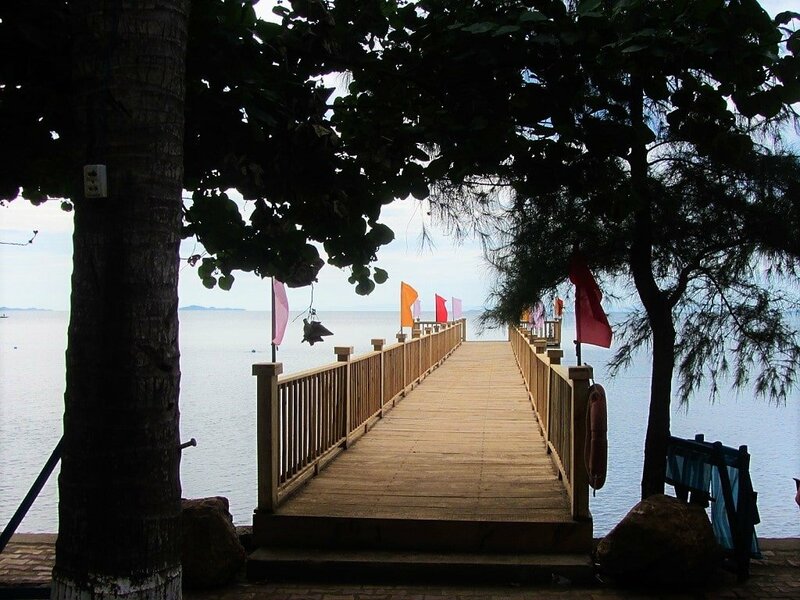 All of Ha Tien’s sights are within walking distance and staff can arrange boat tickets to Phu Quoc Island. Rooms for 1-4 people are between 200,000-500,000vnd. Hai Van Hotel: 55 Lam Son Street; www.khachsanhaivan.com; [MAP] Located a couple blocks back from the riverfront, Hai Van Hotel occupies a shady corner at the intersection of Lam Son and Cau Cau streets, just opposite Ong Bon temple. Its quiet, attractive back-street location, away from the hot bustle of the waterfront, is part of the hotel’s appeal. The cheaper rooms in the old wing are fine if you’re on a real budget, but pay a couple of dollars extra for a room in the new wing and you’ll be rewarded with a balcony with city and river views. 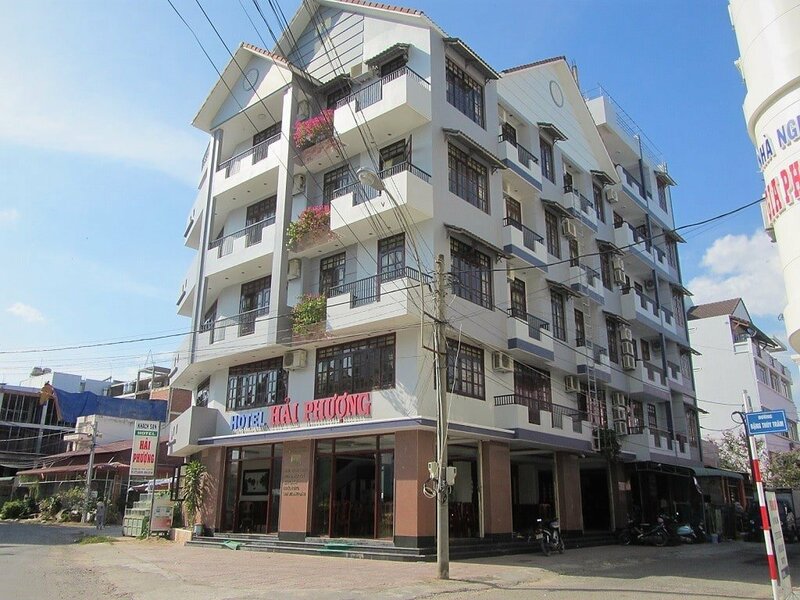 This hotel is comfortable, well-run, and tidy: a classic, good-value, Vietnamese mini-hotel. Prices range from 200,000-400,000vnd. Phao Dai Hotel: 1 Mac Thien Tich; 077 3851 849; [MAP] This is a rather strange place with the potential to become one of Ha Tien’s fanciest lodgings. Occupying a perfect position atop a hillock on the left of the To Chau Bridge as it comes into town, the hotel grounds look out over all of Ha Tien to the north and east, and the Gulf of Thailand to the south and west. There’s even an outdoor pool. However, the hotel itself doesn’t do justice (yet) to its terrific location. The old and new wings have decent rooms with city views (but rooms in the new wing are much nicer). However, there’s the distinctive whiff of officialdom and business about the place, which means there’s also a fair amount of ‘comfort women’ coming and going. Prices are between 350,000-500,000vnd. As well as the two mid-range accommodations listed below, there are a handful of cheaper guesthouses scattered between the waterfront restaurants that line much of Mui Nai beach. 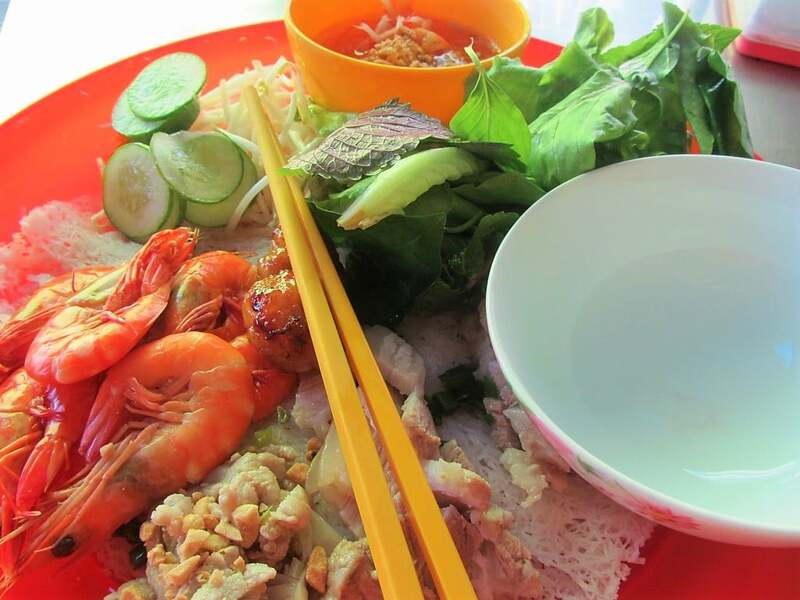 In the mornings, head to Lam Son, a shady and charming street with plenty of breakfast options. Near where the old market used to be, at the intersection with Tuan Phu Dat Street, several local food stalls serve up Mekong Delta soups, such as bún mắm (a pungent fish and egg plant concoction) and bún cá (fish noodle soup), or bánh hỏi (a light and balanced arrangement of rice noodle lattices with accoutrements). Dishes are around a dollar (25,000vnd) each, and you can enjoy your breakfast surrounded by the sound of chirping birds and local women gossiping about food, money, cooking, and the weather. Further up Lam Son, at the corner with Nguyen Than Hien Street, Ms Diep sets up her stall from 7.30am outside the crumbling but handsome facade of the old house at number 49. She serves delicious bún thịt nem nướng (cold rice noodles with marinated grilled pork) and gỏi cuốn (fresh spring rolls) for around 25,000vnd. Meanwhile, at Andy’s Oasis Bar (30 Tran Hau Street), the full English breakfasts are the real deal, and good value at 90,000vnd, but you’ll have to wait until 9am until they open. They also have English Breakfast tea and cafetière coffee. Miến Gà Thúy is a long-established Ha Tien chicken noodle soup stall, next to number 9 on Tran Hau Street, the town’s main drag. The soup is hearty and good, but I wish Ms Thúy was as good at pouring on the charm as she is at pouring on the broth. (35,000vnd a bowl; open all day). The main market complex is good for food throughout the day. 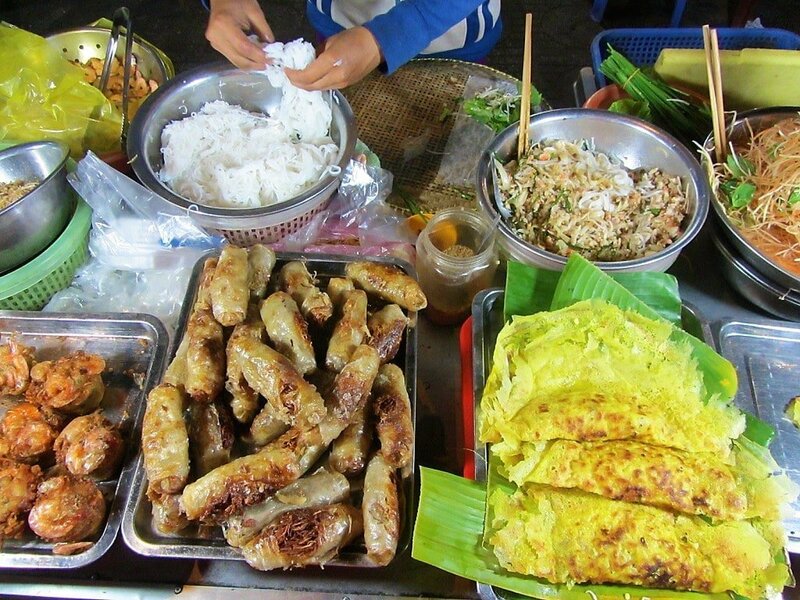 For breakfast, head to the Chợ Ăn Uống-Hoa-Trái Cây (Food, Drink, Flower & Fruit Market). Inside, there are dozens of small food stalls offering a variety of Vietnamese soups, including bún kèn (a fish soup from nearby Phu Quoc Island). This is canteen-style eating; it’s where market workers and fishermen come to eat after their early morning’s work is over. Hong Ngoc (62 Tran Hau) is a good place to pick up a classic bánh mì (Vietnamese baguette) loaded with all the goodies you’d expect: roast pork, cold cuts, pâté, egg, chillies, coriander. 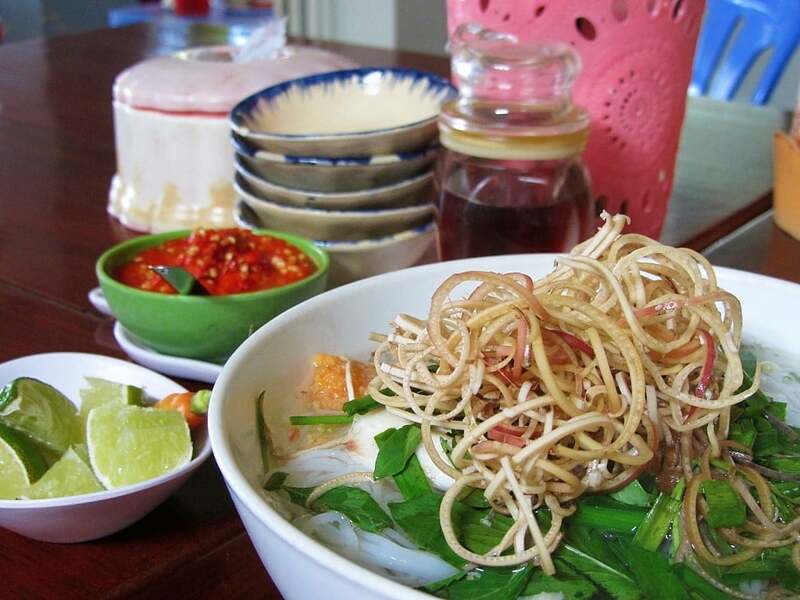 Great for a quick and inexpensive breakfast or lunch, or to take with you for a picnic while out exploring the town (15,000vnd). At the middle of Tran Hau Street are a couple of informal Vietnamese common rice eateries. I love these kind of places: choose from over a dozen home-cooked meat, fish, and vegetable dishes to have over rice. 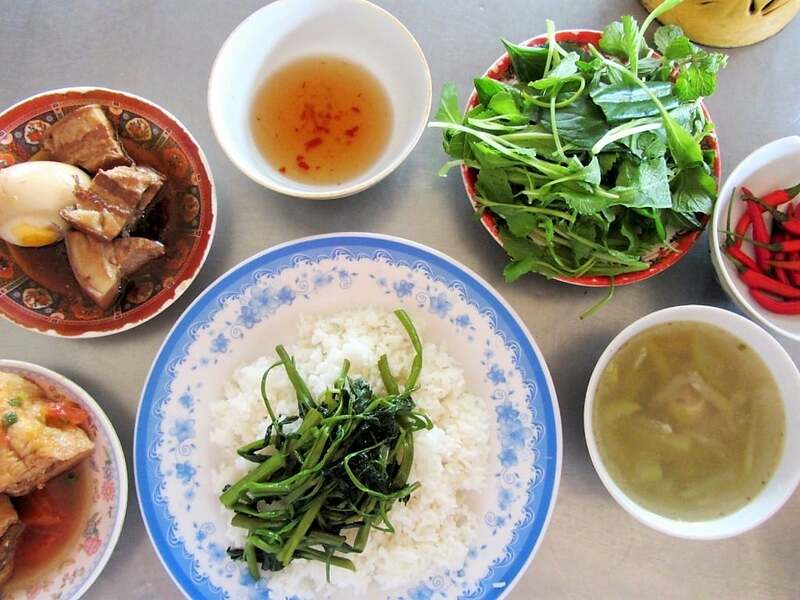 Cơm Ánh Tuyết (63 Tran Hau) is a favourite lunch-stop for locals and domestic tourists alike (25,000vnd per plate). Thanks to the large Buddhist monasteries and temple complexes in and around Ha Tien, there are a few vegetarian restaurants around town. Look out for signs saying cơm chay. Try Thiện Tâm (138 Mac Thien Tich). Mì Nghĩa, at the intersection of Chi Lang and Bach Dang streets, serves good mì hoành thánh (fresh egg noodles with wonton dumplings and shrimp crackers), a Chinese dish that’s popular all over southern Vietnam (25,000vnd; open evenings only). 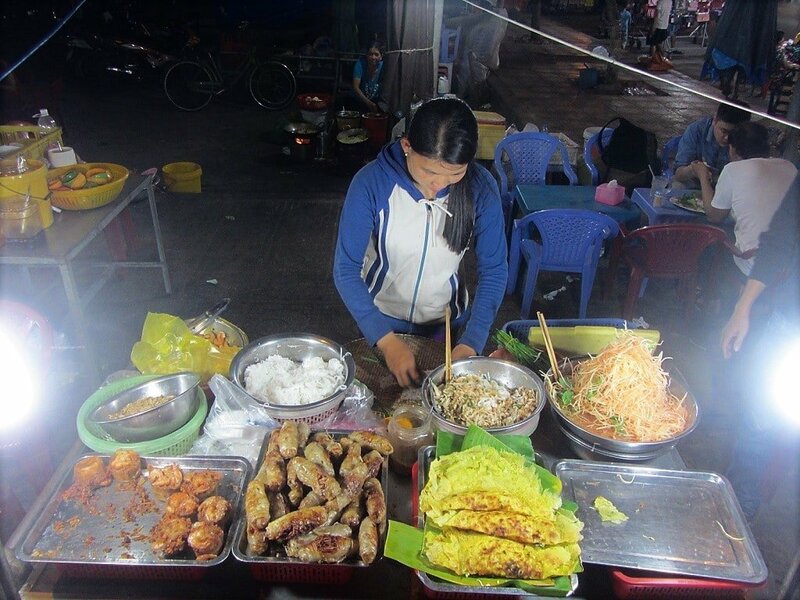 In the evenings, check out the line of street food stalls behind the back of the Chợ Bách Hóa (Dry Goods Market). 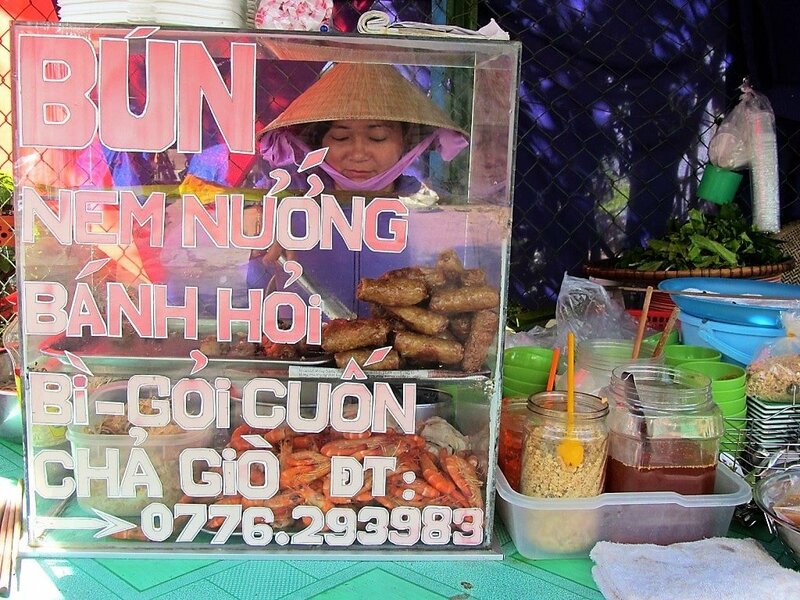 There’s a range of tasty treats available here, but in particular try to find Ms Thuyen’s stall, which is on the left corner behind Chợ Bách Hóa. 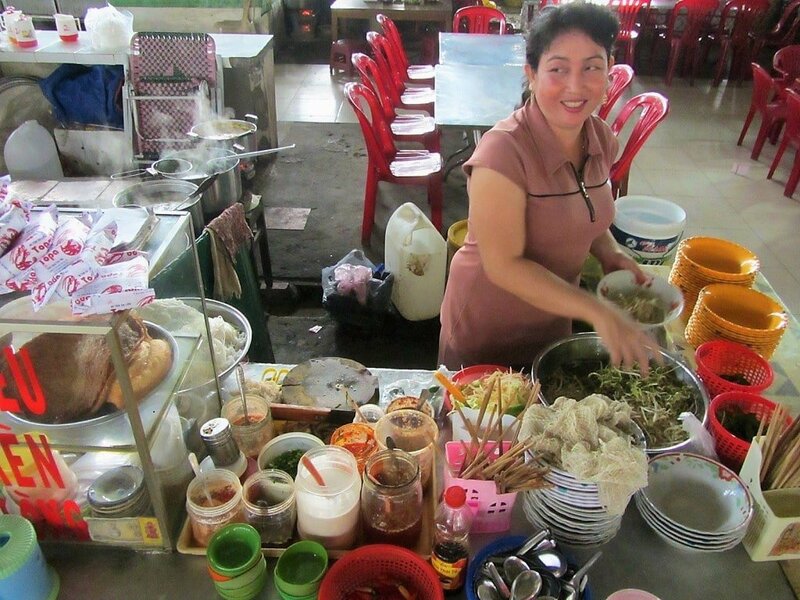 Ms Thuyen and her mum have been selling street food for 40 years. Choose from hủ tíu xào (stir-fried Chinese-style noodles), bánh xèo (savoury crispy pancakes), bún nem nướng (cold noodles with spring rolls), and trứng vịt lộn (the famous fetal duck egg). The food is very good but, as with many of the food stalls around the markets in the evenings, overcharging of foreigners is fairly common. Sadly, this is an inevitable consequence of increasing visitor numbers to Ha Tien. The prices are still very reasonable, so don’t get angry, and bargain politely if you must. Once you head away from the markets and the riverfront (i.e., away from the tourist area), you are very unlikely to be overcharged. A couple of kilometres out of town, due south along the coast on QL80, several seafood shacks open before sunset by the beach. Set under coconut palms and other tropical fruit trees, these eateries offer fresh seafood and superb sunset views over the mirror-flat waters of the Gulf of Thailand. It’s well-worth exploring. 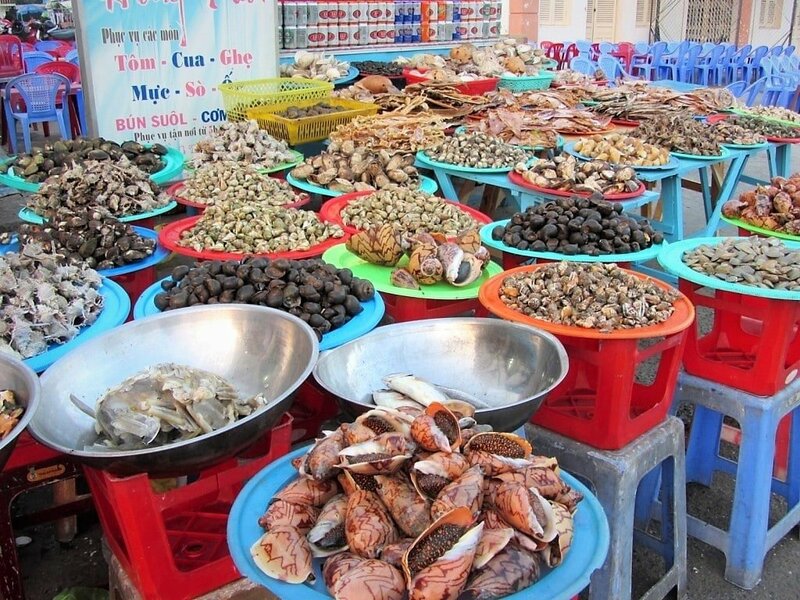 There are also dozens of fresh seafood restaurants lining Mui Nai beach, west of Ha Tien centre. Ha Tien can get very hot during the middle of the day and in the afternoons. Shelter from the heat by stopping for a drink at the floating cafe on Dong Ho Street. Thủy Tiên, which I think means ‘Water Fairy’ (referring to the myth of the fairies on Dong Ho Lake), sells decent coffee and is a good place to catch the breeze off the lake while watching the boats. 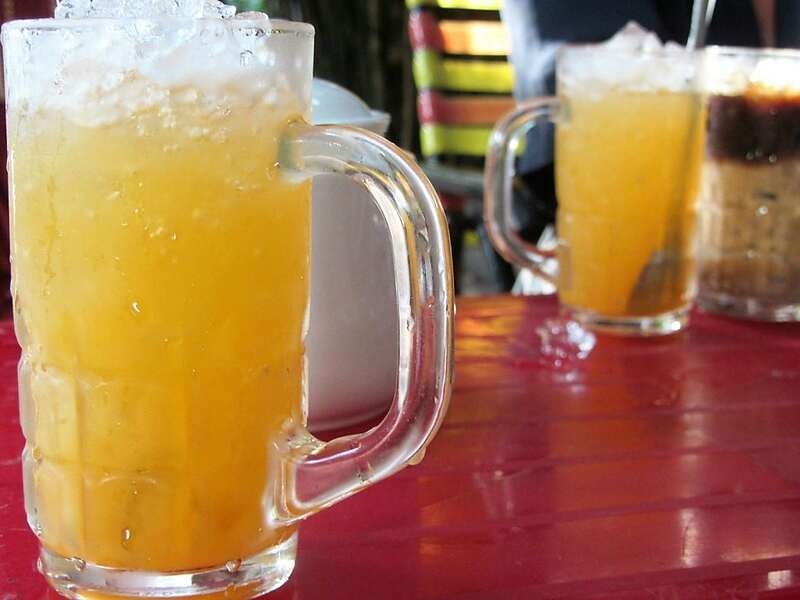 Alternatively, order a cold drink (try the orange juice with no sugar; cam vắt không đường) in the shady and agreeable courtyard of Xuan Mai Cafe, straddling both To Chau and Bach Dang streets. Last but certainly not least, Andy’s Oasis Bar (30 Tran Hau Street) is the place for an excellent gin and tonic (and many, many other drinks besides) from sunset onwards. Andy, a long-term British expat, is good company and he’ll help you sift through his eclectic and tempting menu of classic Western fare and some ‘homey’ dishes from back in the UK, such as black pudding. This is the place to meet other travellers, expats, and English-speaking locals. Andy’s friend, Mr The (0918 574 780), is a local guide and fixer: between the two of them, they can fill you in on pretty much everything Ha Tien-related, as well as help arrange local travel and sightseeing. Prices at Oasis Bar are very reasonable. Local taxis serve Ha Tien fairly well. Mai Linh Taxi (0773 966 966) has a fleet of cars that are great for getting to/from the ferry terminals and bus station, or for a quick trip out of town to Mui Nai beach or the nearby caves. Any hotel can call a taxi for you. 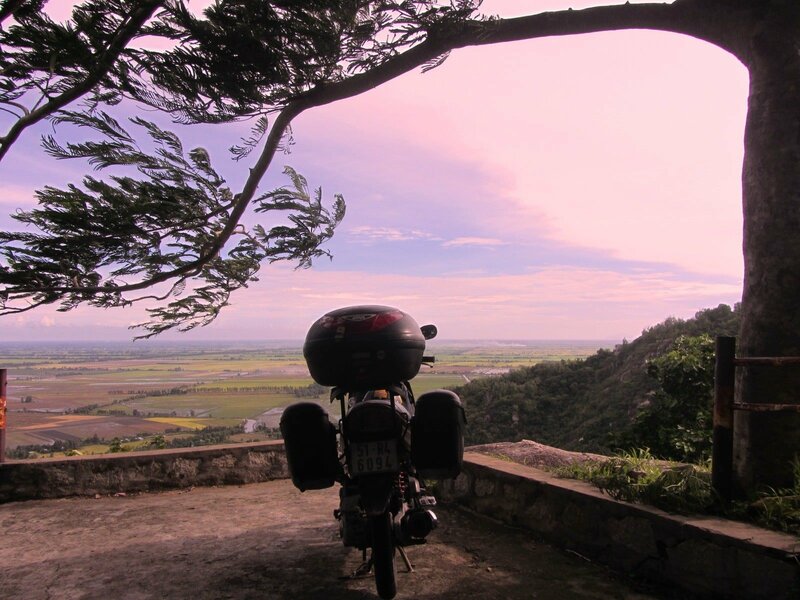 Although Ha Tien is a good town for walking, a motorbike is a great way to visit the outlying attractions, particularly the scenic loop north and west of town via the caves and beaches. Ask at Oasis Bar, where Andy will put you in contact with Mr The (0918 574 780) who’ll arrange a rental motorbike for you (150,000-200,000vnd per day). I think Ha Tien would be a great place to cycle around, but as yet no one seems to be renting bikes. I hope this is something that starts to catch on, because Ha Tien and its environs would make a pleasant cycle ride. Regular buses run in both directions between Ha Tien and Saigon every hour or two throughout the day. However, the most comfortable buses are the sleeper coaches, which usually leave between 7am-10am and 7pm-10pm. Tickets are around 150,000-250,000vnd; journey time is roughly 9 hours. If possible, try to book onto a reliable bus company, such as Phuong Trang (Futa) and Kumho. The Ha Tien bus station has recently relocated across the river and is relatively smart and user-friendly as far as Vietnamese bus stations go. Tickets can be booked at the station or, just as easily, through hotels, travel agencies, and Andy’s Oasis Bar (30 Tran Hau) in town. From Saigon, buses leave from the gigantic, inconveniently-located Mien Tay Bus Station (395 Kinh Duong Vuong, Binh Tan District) from where you can catch a taxi or local bus into the city centre. Ha Tien’s bus station also serves dozens of destinations within the Mekong Delta, with regular connections to Rach Gia, Chau Doc, Long Xuyen, Can Tho, Ben Tre, and Ca Mau among many others. Ticket prices to any of these destinations are between 70,000-150,000vnd. 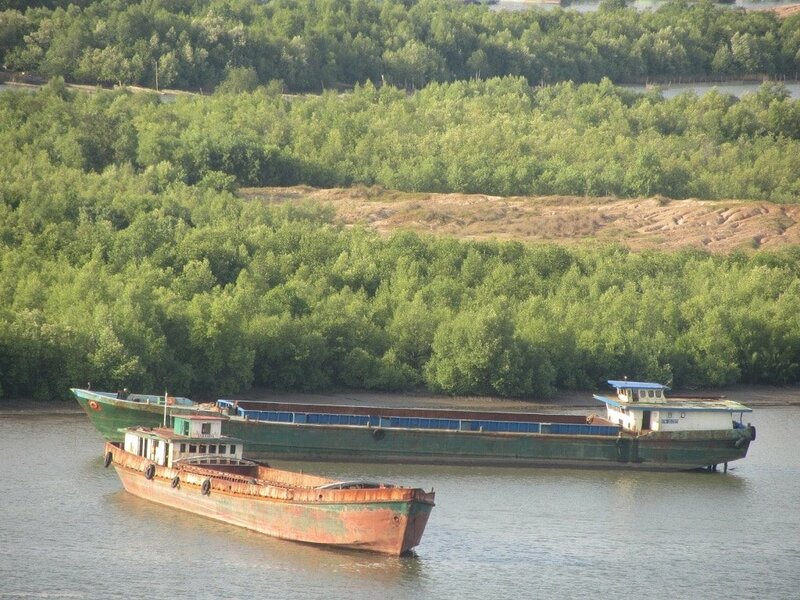 Ha Tien has rapidly overtaken Rach Gia as the major port for boats to Phu Quoc Island. Fast passenger ferries run at least 4 times daily in both directions, and slow car ferries also sail around 4 times a day (there are many more sailings during peak months). Sailing time is 90 minutes/2.5 hours fast/slow boat. 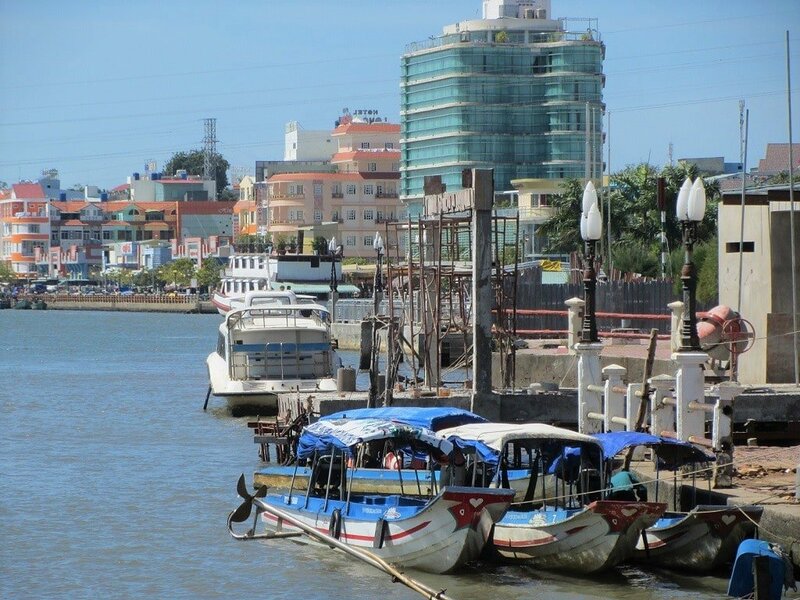 Tickets can be booked at the fast boat ferry pier or the car ferry pier, both of which are located across the Giang Thanh River from Ha Tien centre. However, most hotels and travel agencies can easily book tickets too. In general, most of the fast boats are operated by Superdong, and the car ferries are operated by Thanh Thoi. 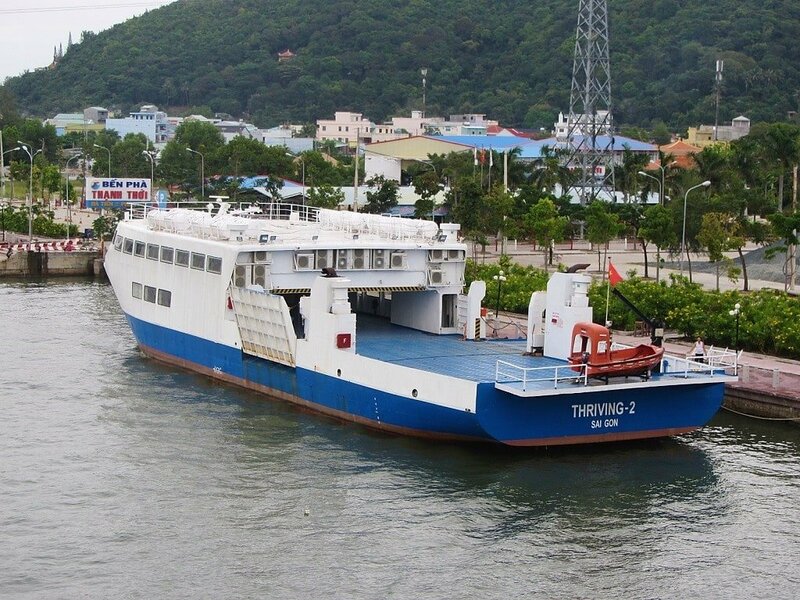 For full details about the boat between Ha Tien and Phu Quoc Island, including ticket prices and sailing times, see my Phu Quoc Ferry Guide. There are daily passenger boats to Tien Hai, part of a small archipelago west of Ha Tien, known as Hải Tặc (Pirate Islands). Sadly, at the time of writing, these islands were closed to foreign travellers, although Vietnamese tourists could visit freely. 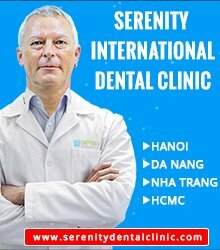 This is subject to change, so it’s worth asking when you are in Ha Tien. It’s a long road trip from Saigon to Ha Tien, but it’s also one of the prettiest ways to see Vietnam’s Mekong Delta region. By staying off the main highways as much as possible, the ride from Saigon to Ha Tien can be a lot of fun, and there’s plenty of good scenery and places of interest to stop at along the way. The distance is 300km, making it a one- or two-day ride by motorbike. By bicycle, this is not a bad route either, because the Delta is very flat so the riding is relatively easy. 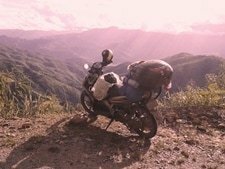 For detailed route information take a look at these two motorbike guides: Saigon to Phu Quoc and Mountains in the Mekong. Vietnam Airlines has one daily flight between Rach Gia and Saigon. Flights in both directions leave between 6am-7am; flight time is just 40 minutes. Tickets are $30/$70 one-way/return. From Rach Gia there are regular buses to Ha Tien (90km; 2 hours). 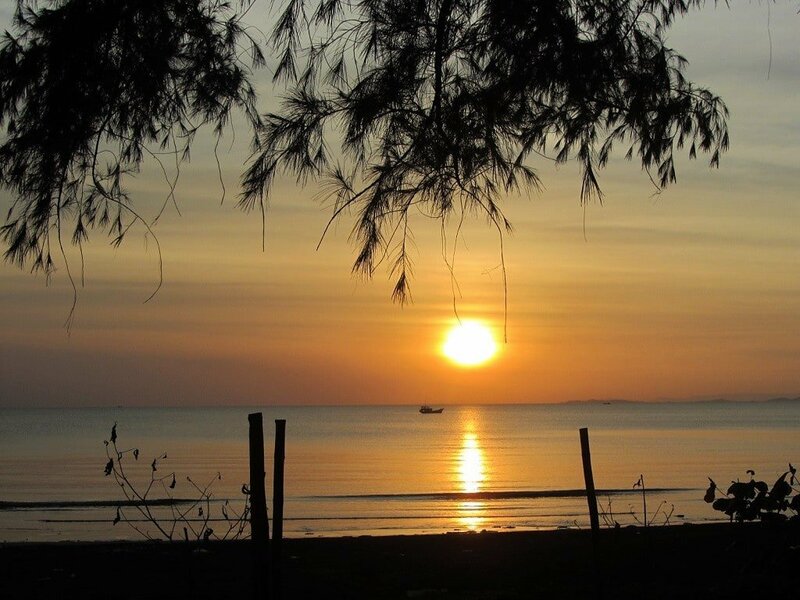 Ever since it opened several years ago, the border crossing near Ha Tien has been a great boon to travellers, allowing them to connect the popular beach destinations of Vietnam’s Phu Quoc Island and Cambodia’s southwest coast. 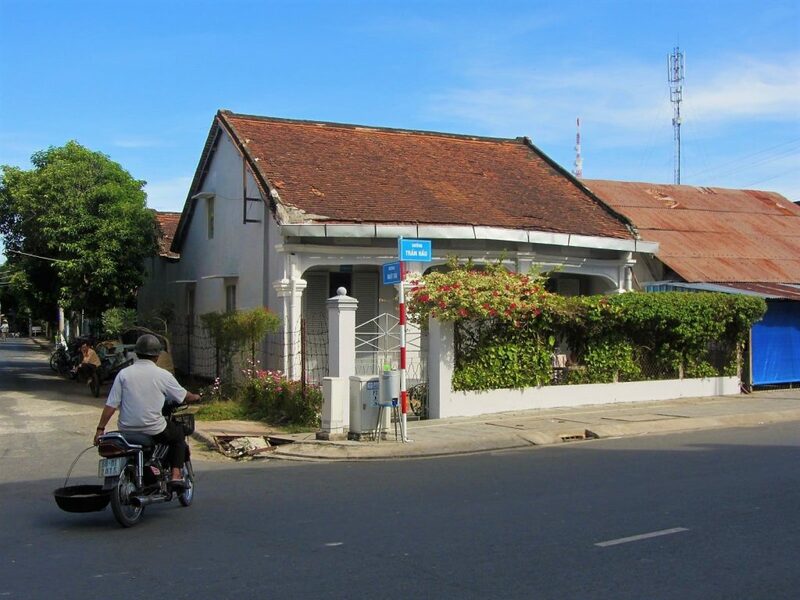 Hotels, travel agencies, and Oasis Bar (30 Tran Hau) in Ha Tien can all offer advice and arrange through transportation to Cambodian destinations, such as Kampot, Kep, Sihanoukville, and Phnom Penh. If you book onto any of these through trips it’s a lot easier than crossing the border alone and relying on public transportation on either side of the border. Also, the through tickets sometimes include the Cambodian visa. The Xa Xia-Prek Chak border gate is just a few kilometres north of Ha Tien town centre. The Vietnamese side is fairly scruffy, but the Cambodian side is pretty new and surrounded by giant casinos. Cambodian visas are issued on arrival for around $30. 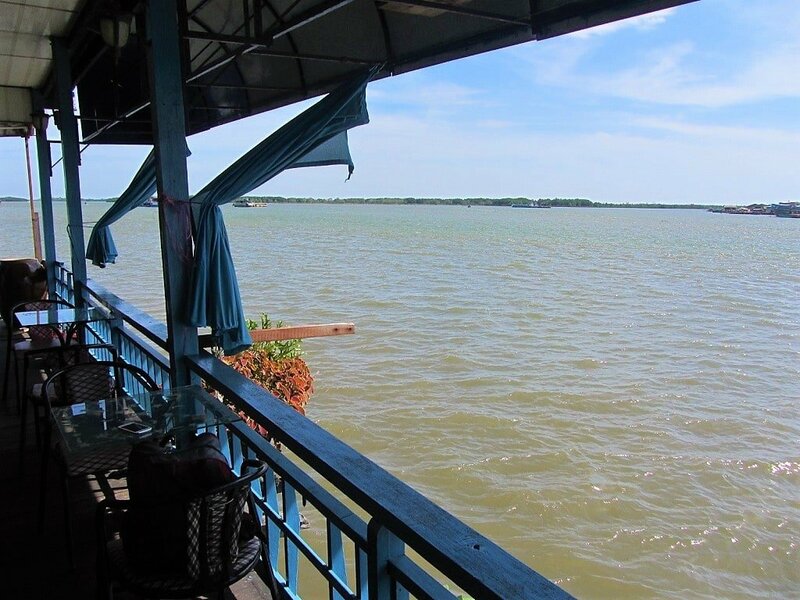 However, prices and procedures are subject to change, so it’s always best to check the current situation by popping into Oasis Bar before making plans to cross to Cambodia. 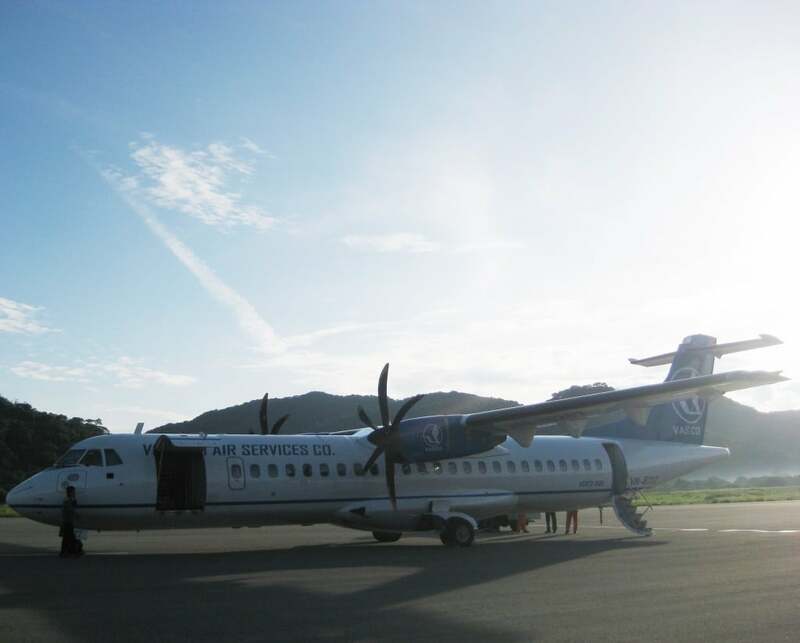 In general, most travellers in Ha Tien are either on their way to or from Cambodia, so there’s a lot of information and agencies catering to this route. Always ask around and compare prices and opinions before committing to anything. This entry was posted in ALL, DESTINATIONS, Mekong Delta, The South and tagged border, Cambodia, guide, ha tien, Mekong Delta, Mui Nai Beach, Prek Chak, travel, Vietnam, Xa Xia. Bookmark the permalink. 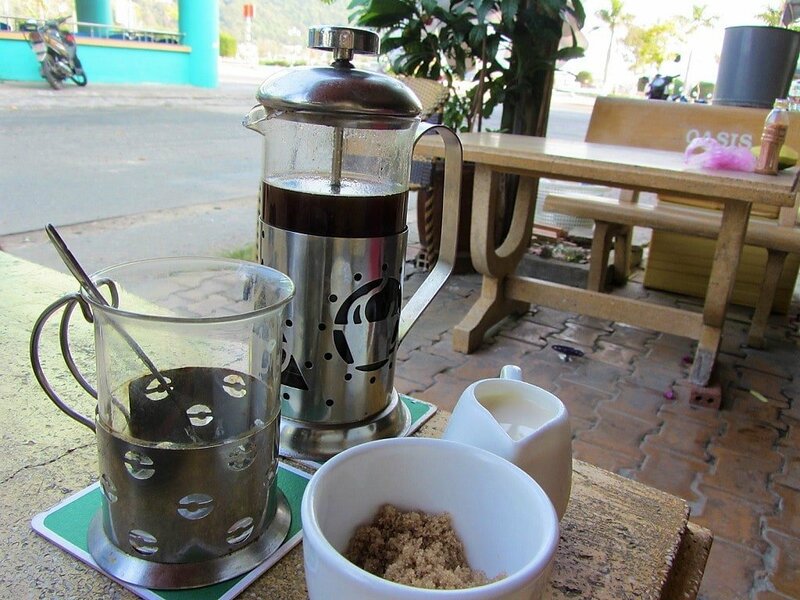 We are staying in Ha Tien at the moment and just thought I would give an update on a few things on your review. Well yes there is still, but the whole beach, surrounding area, and equipment are largely deserted and not used, and we were there on a Saturday! The beach just to the South had a reasonable number of people, mostly Vietnamese, and a handful of foreigners. Not what I would call a beach by Australia standards, but at least had a nice relaxing feel about it and the water was warm and calm with nice views. The whole area though does seem to look like it was great and popular once, but not so much now. The resorts flanking seem to be run down also and in need of some serious tic. Oh, and one more thing, we got charged 10000 doing to enter, definitely not a deal breaker as overall we enjoyed the day. Yes, Mui Nai certainly isn’t a ‘great’ beach, but it’s a good, fun, easy excursion from Ha Tien town and some of the surrounding countryside is pleasant. I’m surprised to hear it wasn’t busy on the weekend – perhaps it’s the lull before the Tet holidays. I spend a few days at the northern Mui Nai beach mid february and loved it. Very clean because 5 people constantly sweeping and cleaning the beacht from rubbish and fallen leaves. About 100 brand new free to use sunbeds and umbrellas. Busy during the weekend with locals eating and karaoke-singing at the restaurants while the beach itself quiet and relaxed. During weekdays more quiet but still lively. More roadconstruction going on and parkingarea’s being build to improve the whole area. Thank you for the updates, and it’s great to hear you enjoyed Mui Nai beach. Hi again. Now, after two times being in Vietnam by scooter, this is one of two loations, which I still need to discover. Do some people sell scooters or motorbikes in Ha Thien? 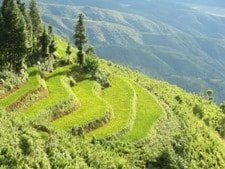 Is it worth to visit Rach Gia and Dat Mui and from there along the Coast to Vinh Chao and Soc Trang? Or shall I better save some miles and head directly to from Rach Gia to Can Tho? BTW, thx again for uncle ho’s road. Personally, I would save your time in the Mekong Delta for the western corner, including Ha Tien, because this is the most attractive and interesting part of the region, in my opinion. For motorbike rental in Ha Tien you can try contacting Andy at Oasis bar – they should be able to sort something out for you. Thank you Tom, I’ll post here anything that I find out. Yes, it’s possible. I haven’t done it for years, but a few of my readers have written to say they have also done it. Try searching TripAdvisor for this topic, because I remember seeing a very good, up-to-date and detailed post about the border crossing on there recently.